Fabrication in BBC Panorama 'Saving Syria’s Children' | Analysis of the 30 September 2013 BBC Panorama documentary 'Saving Syria's Children' and related BBC News reports, contending that sequences filmed by BBC personnel and others at Atareb Hospital, Aleppo on 26 August 2013 purporting to show the aftermath of an incendiary bomb attack on a nearby school are largely, if not entirely, staged. 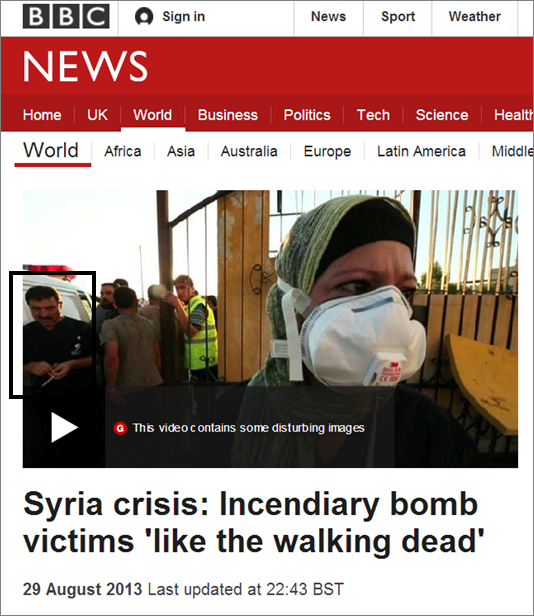 Analysis of the 30 September 2013 BBC Panorama documentary 'Saving Syria's Children' and related BBC News reports, contending that sequences filmed by BBC personnel and others at Atareb Hospital, Aleppo on 26 August 2013 purporting to show the aftermath of an incendiary bomb attack on a nearby school are largely, if not entirely, staged. 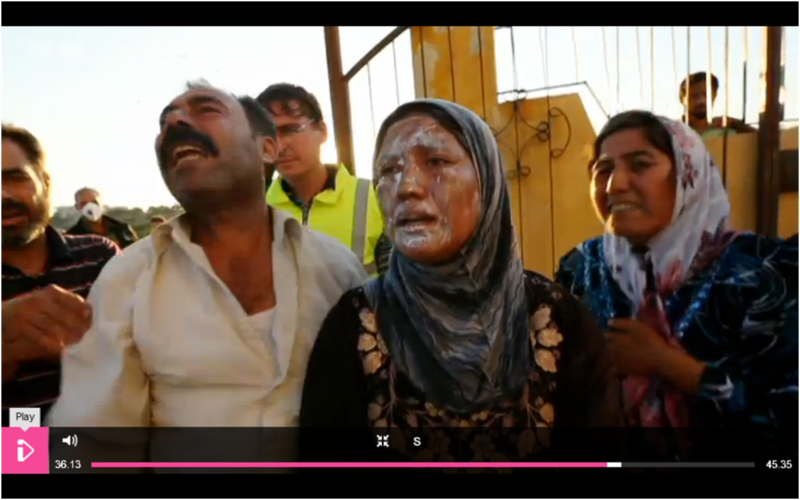 Syria crisis: Incendiary bomb victims ‘like the walking dead’ – Ten O’Clock News, BBC One, 29 August 2013 (03:02 – 03:19). Alleged casualties appear to begin writhing and moaning on cue of central figure. See Tableau of male alleged casualties. Alleged victim Ahmed Darwish appears to nod in response to instruction before turning to address the camera. Medic featured in BBC’s reports appears to demonstrate amusement in interview filmed the next day – see Laughing medic and The Napalm d’Or?. Alleged eye witness Abu Youssef, interviewed in a video uploaded to You Tube less than a week after the alleged attack. Youssef’s words at this point have been translated as “The first bomb hit a residential area, the second one a student centre”. (See also Conflicting accounts of time of “napalm bomb” and The Napalm d’Or?). 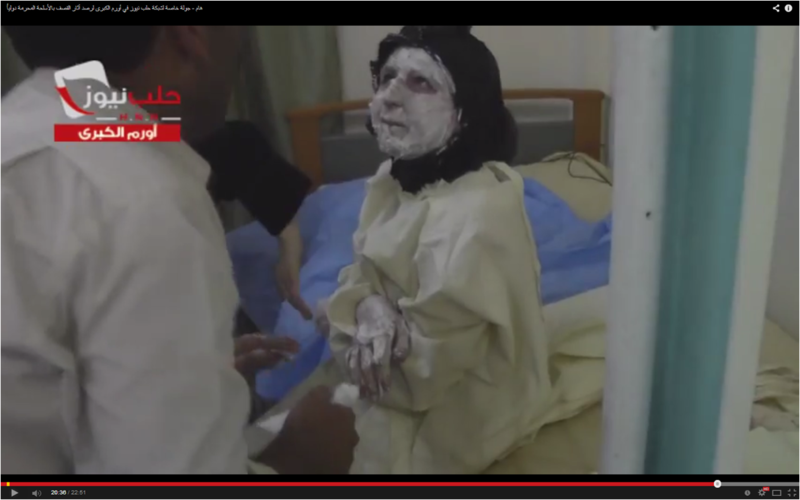 Alleged napalm victim appears entirely unscathed – see Woman in black dress (end of article). 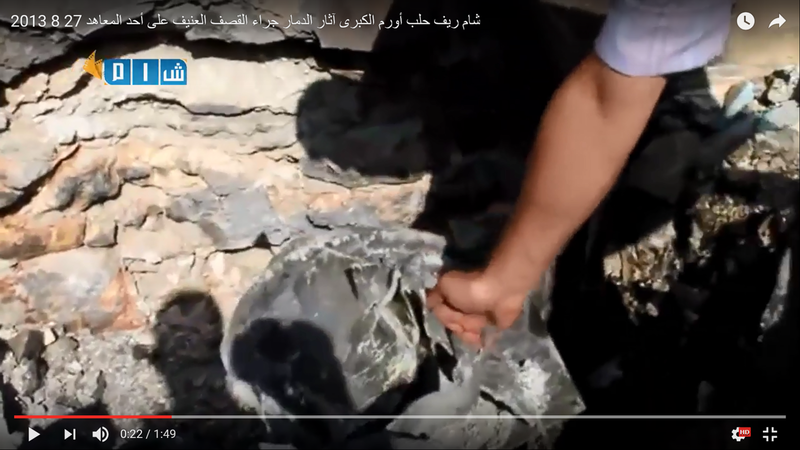 Alleged napalm victim (white t-shirt) appears to sway and lurch in bizarre manner in ‘Saving Syria’s Children’ – see Alleged teacher and The Napalm d’Or?. 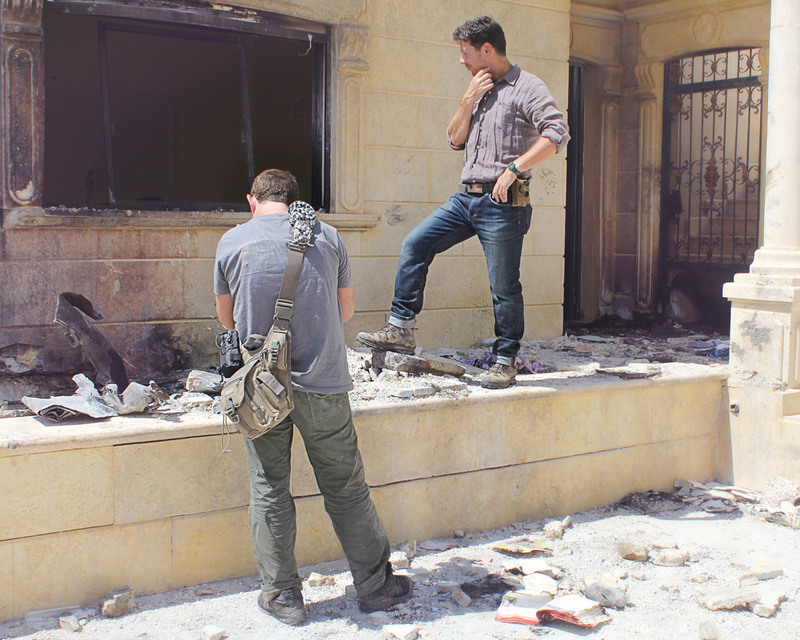 Unidentified male appears to be alerting BBC cameraman Darren Conway to an emotive scene – see Saving Syria’s Children: The Director’s Cut?. Presentation: Media on Trial, 19 October 2017, Bloomsbury Central Baptist Church, London. Please note that this video has been age restricted by YouTube on the grounds that “it may not be appropriate for a general audience” – an alternate copy can be viewed here. An updated version of this presentation expanding on the links between the BBC Panorama team, ISIS and the White Helmets can be viewed here (also age restricted). Presentation for Frome Stop War, 1 March 2016. Listed below are the original BBC reports referenced in this blog, including an HQ copy of Saving Syria’s Children (relevant section commences 30:38), plus independent reports and commentary. 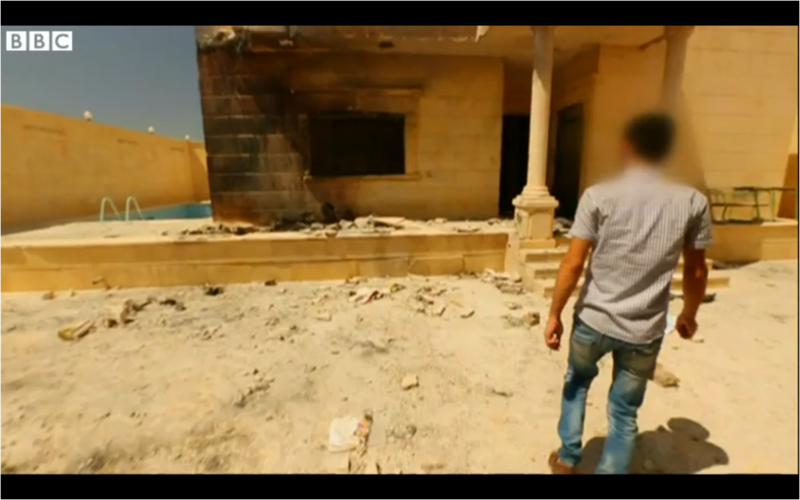 On 29 August 2013, as the UK House of Commons vote on possible military intervention in Syria was underway , BBC News at Ten broadcast a report by Ian Pannell and cameraman Darren Conway which claimed that a Syrian fighter jet had dropped an incendiary bomb containing a “napalm-type” substance – possibly thermite – on the playground of an Aleppo school. Click on image for copy of BBC News report of 29 August 2013. Previously available on YouTube, removed January 2019. The report remains on the BBC News website. The report contained harrowing scenes of teenage boys and young men, their skin apparently in tatters, racing into what the report describes as “a basic hospital funded by handouts” to be treated for burns. In one particularly disturbing scene (from 03:02 – 03:19) a tableau of young men writhe, drool and groan, seemingly in great distress. On further viewings, however, this scene in particular is strikingly odd. The young men are initially quiet and static. The central figure (Mohammed Asi) looks directly into the camera for several moments before raising his arm, at which point the group instantly becomes animated and starts moaning in unison. Compare the demeanour of the young men above with that of Vietnam napalm bombing survivor Kim Phuc and these Egyptian victims of an Israeli napalm attack. This scene and other questionable aspects of this brief report prompted my first letter to the BBC on 4 October 2013. Click on image for copy of BBC News report of 30 September 2013. The report remains on the BBC News website. Comparing the 29 August and 30 September reports a discrepancy in the soundtrack was apparent. In the first, Dr Rola Hallam (her face covered by a mask) had referred to “napalm”, in the second she said “chemical weapon”. I commented on this in the PS to my letter. The audio editing was subsequently discussed by former UK ambassador and blogger Craig Murray here and here. Speculation on this point has since been widespread (see for example here and here; my opinion on the matter is here). My concern remains on the evidence of wider fabrication in the hospital scenes. The BBC’s initial response of 2 December 2013 dealt largely with the editing of Dr Rola Hallam’s words. My correspondence with the BBC continued. Some of the main points which arose, or have arisen subsequently, are as follows. Fuller details here. See also this article on the website OffGuardian and Outbreak of journalism at the Frontline Club? Accounts of the time of the alleged bombing span a range of six hours. A Human Rights Watch report states (p12) that the attack occurred “around midday”; the HRW report links to a further report by the Violations Documentation Center in Syria – a regularly cited BBC source -which claims (p4) the attack took place at 2.00pm and directly quotes activist Mustapha Haid as saying he first heard rumours of a “chemical attack” at “3 in the afternoon”. Haid then “immediately” went to Atareb Hospital to film the alleged victims. ‘Saving Syria’s Children’ reporter Ian Pannell categorically stated in BBC Complaints correspondence that the attack happened “at around 5.30pm at the end of the school day”. When questioned about the time of the incident, Pannell’s sole BBC colleague on the programme, cameraman, director and producer Darren Conway, responded “I would say it was around, I don’t know, between three and five, something like that”. 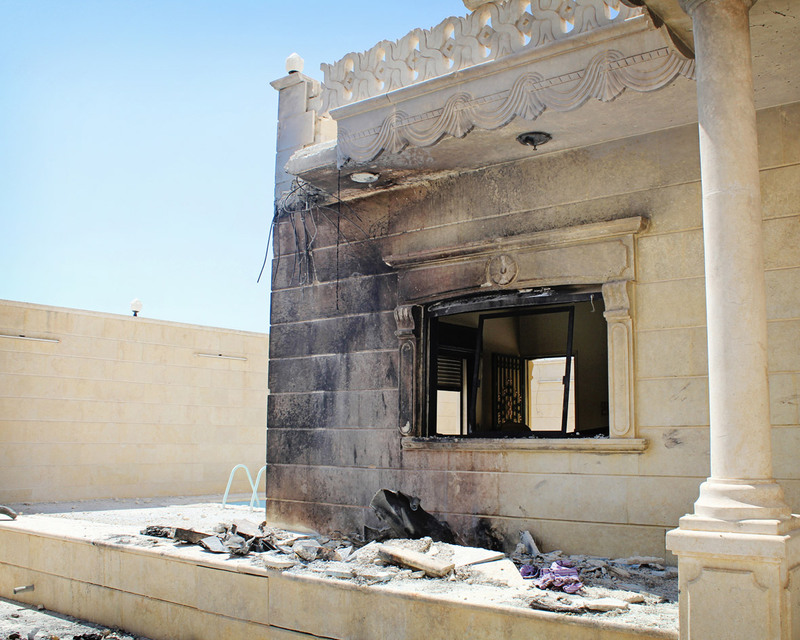 It is unclear whether Conway was giving his assessment of when the alleged incendiary attack on the school in Urm al-Kubra (Urem Al-Kubra) took place or was referring to the subsequent arrival of alleged victims at Atareb Hospital several miles away, where he filmed them. Video of Conway’s interview at The Frontline Club, London, in which this apparent contradiction arose remains unpublished. The Frontline’s justification for this change in its usual policy appears unpersuasive. ‘Saving Syria’s Children’ cameraman, director and producer Darren Conway at the Frontline Club, London on 15 October 2014, responding to a question about the time of the alleged incendiary bomb attack: “Towards the end of the day, yeah, I mean I don’t remember the exact time… …I would say it was around, I don’t know, between three and five, something like that.” (Mobile phone footage http://1drv.ms/1DfBr2T). Conway’s sole BBC colleague on “Saving Syria’s Children”, reporter Ian Pannell, has stated that the alleged attack on the school in Urm Al-Kubra, some distance from Atareb Hospital where Conway filmed the alleged victims, occurred “at around 5.30pm at the end of the school day”. Scrutiny of scenes in Saving Syria’s Children reveal that reporter Ian Pannell and cameraman Darren Conway were embedded with jihadi group Ahrar al-Sham which, according to Human Rights Watch, had three weeks earlier worked alongside Islamic State (IS) and al-Qaeda affiliate Jabhat al-Nusra as one of “the key fundraisers, organizers, planners, and executors” of an attack in which at least 190 civilians were killed. A 2013 Foundation for Defense of Democracies report states that a “leading figure” in Ahrar al-Sham, Abu Khalid al-Suri – real name Mohamed Bahaiah – had been identified by Spanish investigators as “one of Osama bin Laden’s most trusted couriers”. Update October 2017: Shadow Foreign Secretary Emily Thornberry MP has written to BBC Panorama editor Rachel Jupp relaying my concerns about this aspect of Saving Syria’s Children. 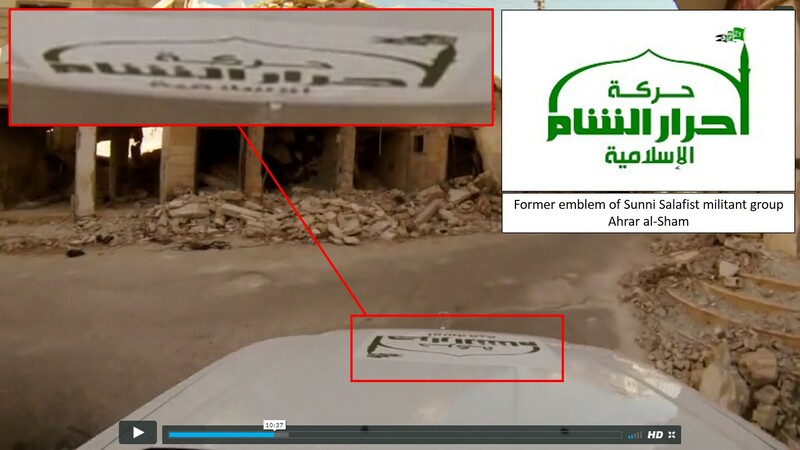 Pickup truck in convoy transporting BBC reporter Ian Pannell and cameraman Darren Conway on 26 August 2013 bears the former logo of Salafist militant group Ahrar al-Sham (Saving Syria’s Children, BBC1, broadcast 30 September 2013). Fuller details here and here. 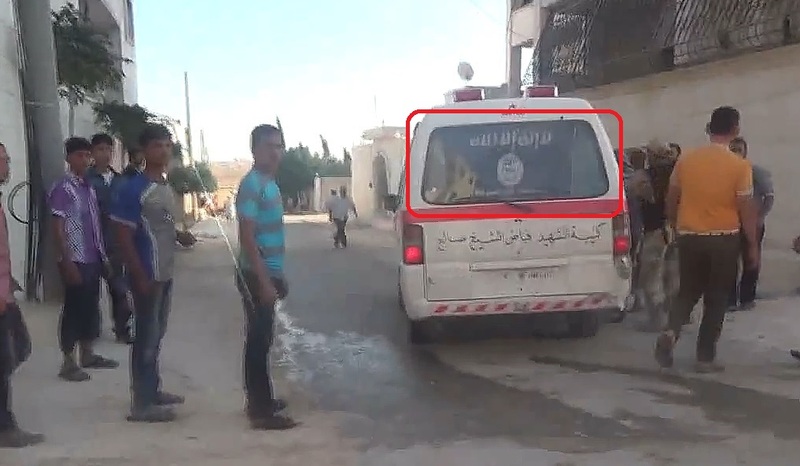 Scenes filmed by BBC cameraman Darren Conway for Saving Syria’s Children feature an ambulance displaying the ISIS flag. 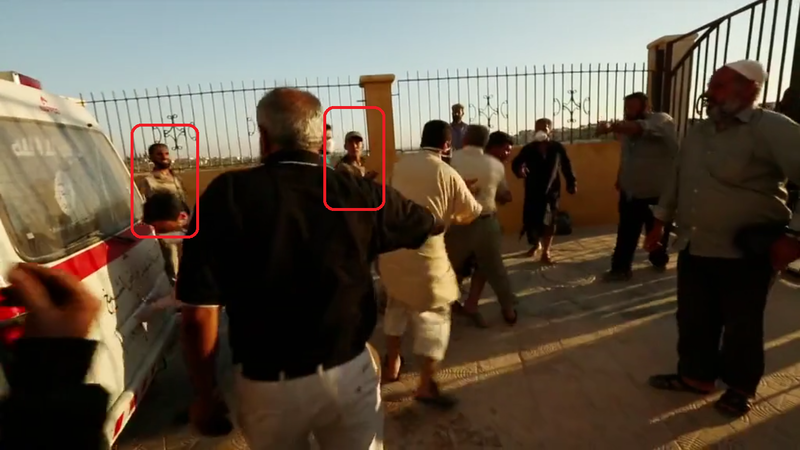 The proximity of Conway and Panorama reporter Ian Pannell to the ISIS vehicle and its armed occupants at Atareb Hospital on 26 August 2013 contrasts markedly with an ostensibly tense scene shot the previous day in which the two-man BBC team passes through an ISIS checkpoint in apparent fear for their lives. Fuller details here. See also section below Violations Documentation Center in Syria. In complaints correspondence the BBC claimed that alleged teenage victim Lutfi Arsi “died on his way to hospital in Turkey”. However, in a gallery of images accompanying a contemporary report on the website of Turkish daily newspaper Hürriyet, Arsi is pictured arriving in an ambulance at Reyhanli State Hospital, Turkey. Alleged incendiary bomb victim Lutfi Arsi arriving at Reyhanli State Hospital, Turkey on the evening of Monday 26th August 2013. The BBC has stated that Arsi “died on his way to hospital in Turkey”. 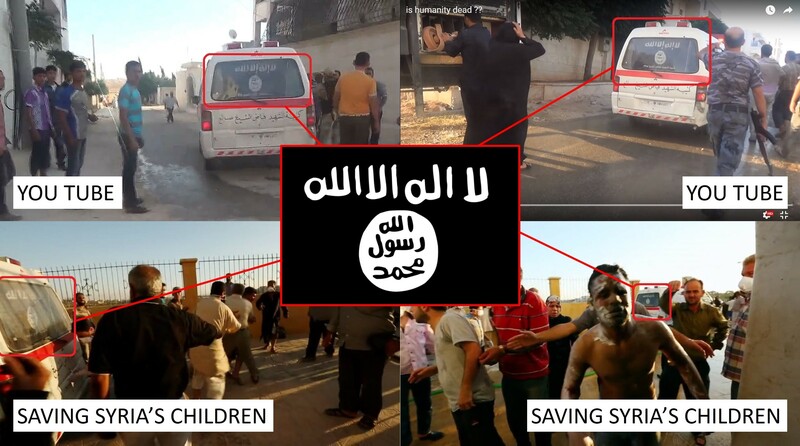 Lutfi Arsi at 37:52 in Saving Syria’s Children (left) and arriving at Reyhanli State Hospital, Turkey later the same day. 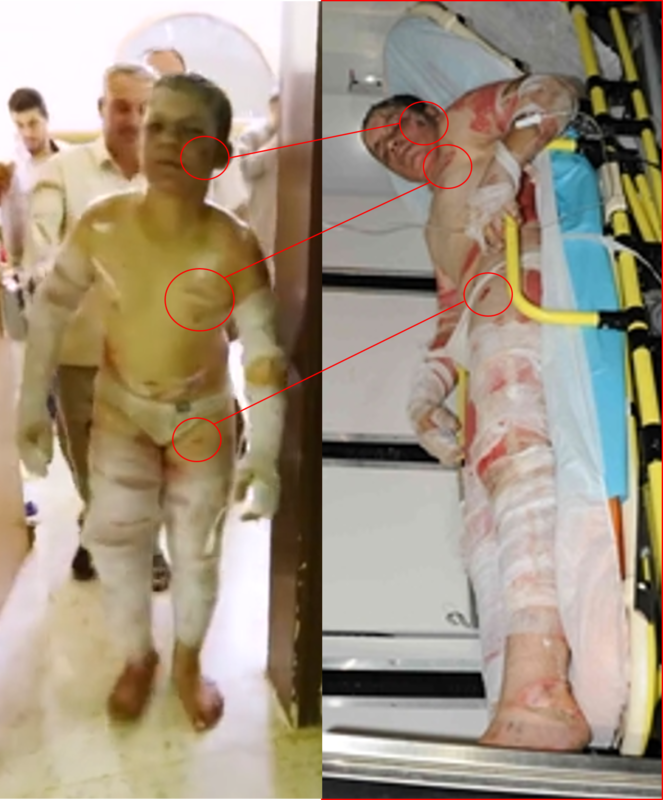 A comparison of the pattern of alleged injuries makes it clear that it is the same boy in each image. A series of eighteen photographs showing two alleged victims originally appeared on the photo journalism website Demotix dated 25 August 2013. Demotix later amended the date of the photographs to 26 August. 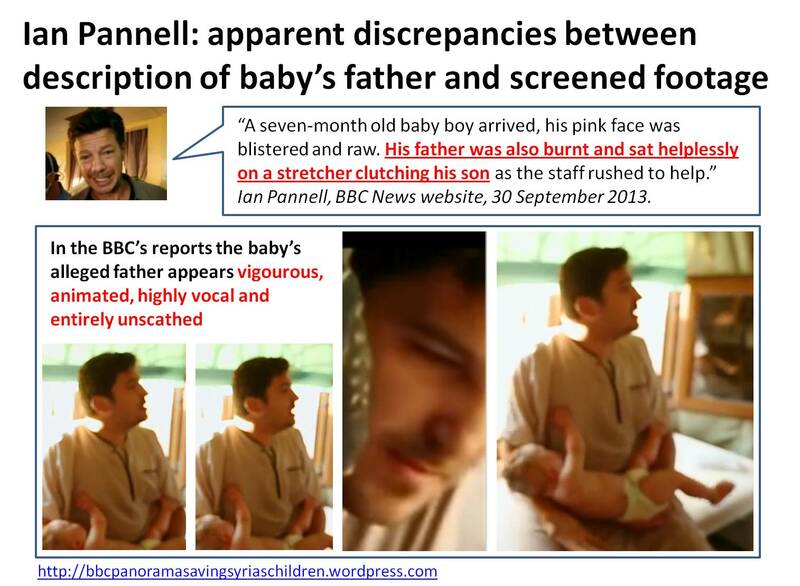 When the images were dated 25 August, Ian Pannell denied that they featured victims from his report ; after the date had been changed, the BBC acknowledged that they did. Update, 18 November 2015: oddly, the images are currently once more dated 25 August 2013 on the Demotix site – see this dated and timed screengrab. Update: as of 22 January 2016 the Demotix images are being hosted on the website of Corbis Images and are once again dated 26 August 2013. 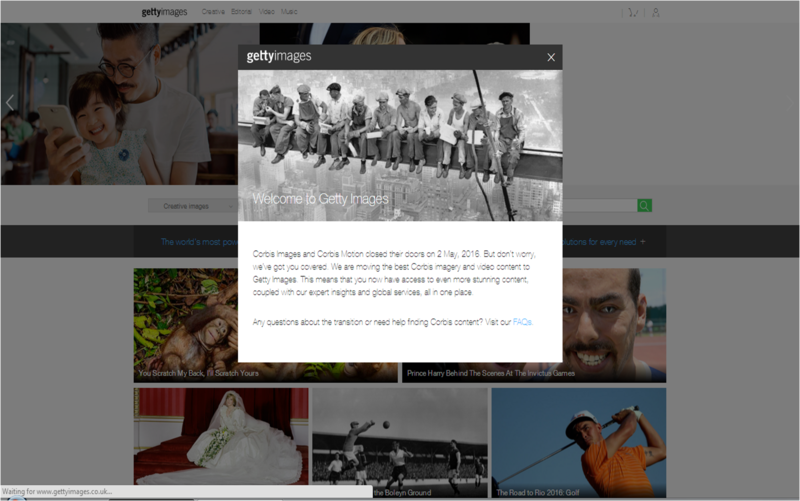 Update: On 2 May 2016 “the best Corbis imagery” was transferred to the website Getty Images. The images at issue here were not transferred to Getty; however screengrabs from the original Demotix posting (dated 25 August) are here and downloads of the full set are in the appendix at the bottom of this page. Note: Although I was initially interested in the discrepancy in the dates between the Demotix uploads and the BBC’s narrative, I am now reasonably satisfied that this was likely due to an error on the part of the photographer, Amer Alfaj, when uploading his images to Demotix (I made a test upload to Demotix when it was in operation and this was entirely possible). 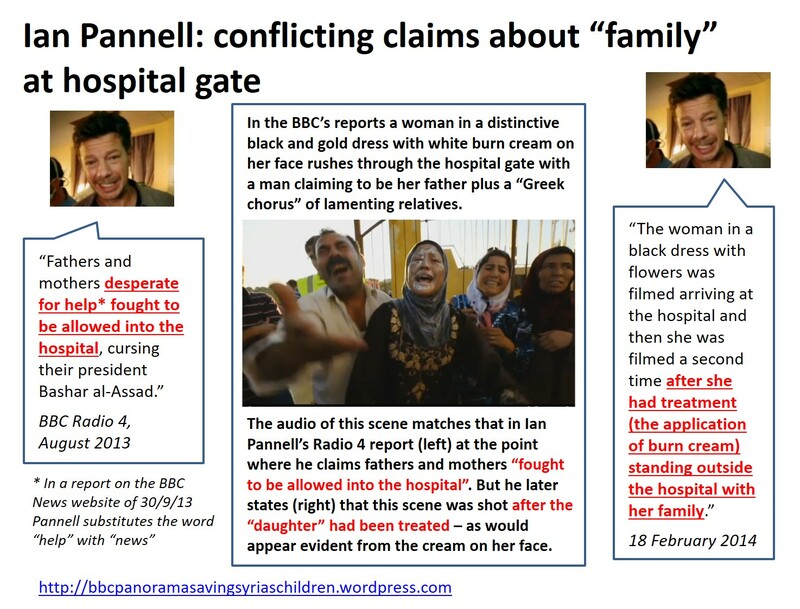 The interest in the images for me therefore primarily now lies in Ian Pannell’s denial (contained in BBC Audience Services’ response of 18 February 2014, which Pannell authored) that they featured victims from his report when in fact “Victim A” (see here) possesses the most distinctive pattern of alleged injuries of all the alleged victims featured in Pannell’s reports. 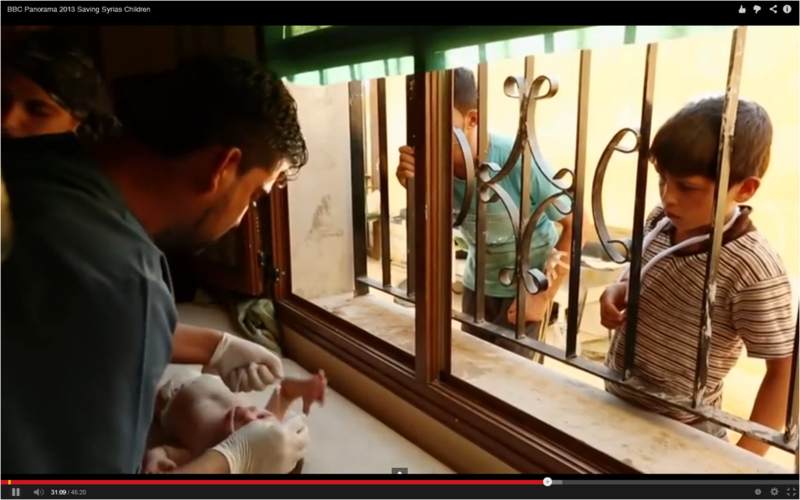 At 31 minutes in Saving Syria’s Children Dr Saleyha Ahsan is shown attending to the first alleged victim – a baby, accompanied by his father. Ian Pannell’s narration at this point states “no-one’s quite sure what’s happened.” Only subsequently do the “dozens” of other alleged victims begin to arrive. This sequence of events is portrayed in several other accounts, including others given by Dr Ahsan. In this version, the baby and his father do not feature at all. 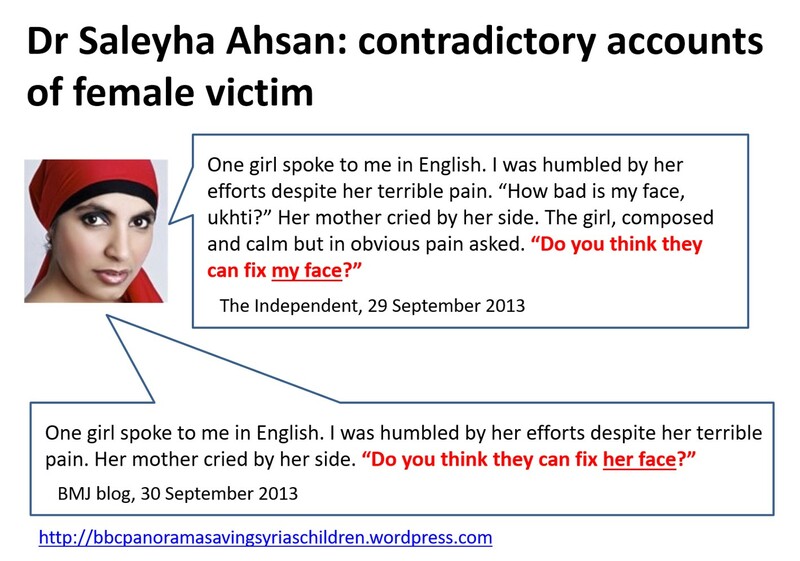 Instead Dr Ahsan states “it was quite a quiet day” prior to the arrival of the person she now claims was the first victim – a boy covered in “strange white dust”, who had a “huge laceration on the side of his face” and who spoke to her, asking her where he should go. This clear and vivid account is entirely irreconcilable with what viewers saw in ‘Saving Syria’s Children’. The sound of an ambulance siren and then the screams first of all from a baby and then young girls – that I still hear as I write this – alerted me that something disastrous had happened. These and a number of further inconsistencies between Dr Ahsan’s accounts of the alleged events of 26 August 2013, and between Dr Ahsan’s accounts and those of others present, have been compiled with full references here. A number of contradictions in accounts given by Ian Pannell are gathered here. A further complaint (see here and here) regarding apparent breaches of the Geneva Convention by Dr Ahsan in Libya in 2011 has been lodged with the BBC and copied to Amnesty International’s Libya Team. 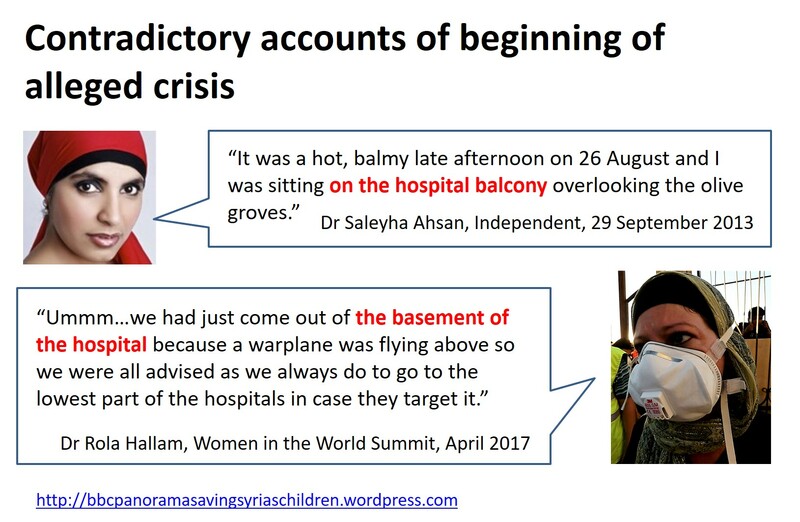 Update: at the 2017 Women in the World Summit in New York Dr Rola Hallam gave an emotive account of the alleged events of 26 August 2013 which is at variance in several significant respects with the BBC’s screened footage and other prior accounts, including Dr Hallam’s own – see New, inconsistent, “napalm bomb” account goes viral. This information was submitted to the BBC by email on 5 November 2014. Fuller details here. See also The Napalm d’Or?. The image below is from a sequence originally transmitted in the BBC News report of 29 August 2013. The slim boy in the black vest at the right of the picture, allegedly the victim of a “napalm-type substance”, is looking into the camera and grinning broadly. The same boy appears at 31:56 in Saving Syria’s Children, apparently moments later, running into the hospital with his jeans lowered and again at 35:15 exclaiming “cover me” while allegedly being treated for his injuries by Dr Saleyha Ahsan. (See further images here). 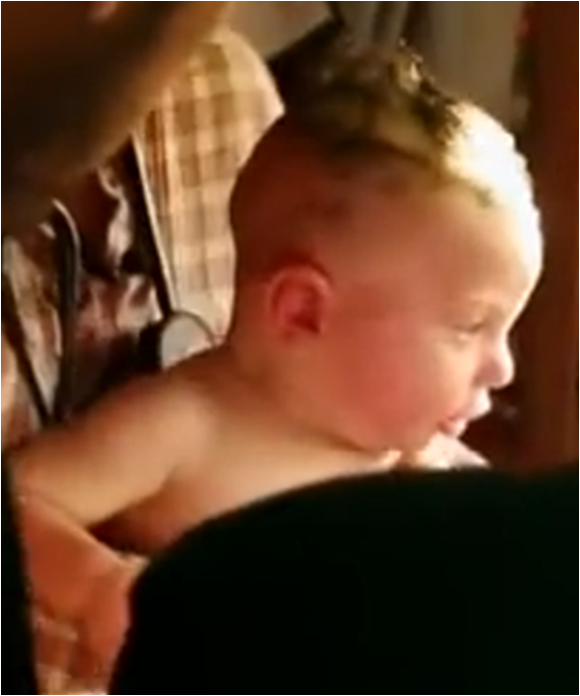 The baby featured from 31 minutes in ‘Saving Syria’s Children’ does not appear to have suffered “severe burns” as claimed in the narration, and certainly not the 80% burns (elsewhere “full-body burns”) claimed by Dr Hallam which, as the high percentage indicates, would cover the majority of the infant’s body. Rather, he appears unscathed and in no unusual degree of distress (click images below to enlarge). At 31:18 Dr Ahsan’s advises “this baby needs to be picked up” and the child is robustly handled by Dr Ahan and the supposed father. 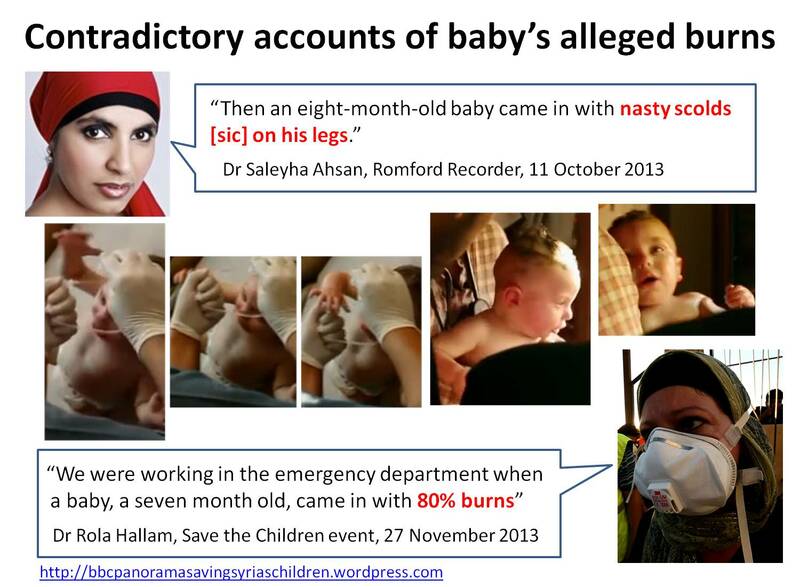 If the baby had suffered severe burns covering up to 80% of his body this would appear extremely inappropriate and reckless.Subsequent accounts of the infant’s injuries range from “nasty scolds [sic] on his legs” (Dr Ahsan) to Dr Hallam’s “80%”or “full-body” burns. See below – HOSPEX injury simulation techniques. I have watched the panorama BBC documentary. Makes for interesting viewing but I think the scene of the school children coming in with the burns was an act. would be screaming the place down in agony. Even after treatment and with all sorts of pain drugs they still hurt and still scream. Many burns victims cannot even focus enough to follow instructions such as sit down and wait because of pain. This young boy, I found very odd (I don’t think it is cultural thing as pain is pain and it can drive a person mad). would have difficulties with their airways, almost immidiatley, hence in the UK many are intubated and treated in ITU. This shows them able to speak and breathing very well no obvious signs of respiratory distress like coughing, shallow breathing etc. In such an attack the poisons are inhaled. They say they douse them in water (wouldn’t the high spray of the hose cause more problems to burnt skin). when they came to the hospital they have evidence of this white powder on their skin but not evident burn blisters which fill with fluid with in minutes. Some are shown with skin hanging off but the flesh beneath is not that convincing it actually looks like more skin. The walk is very odd. why?? The other concern in burns is their fluid status as they will be losing large amounts of fluid through their burns. The cannula is essential to resuscitate them. Im not sure what A and E that doctor worked in but I have not worked in A and e this year and I have placed I think almost 6 cannulas in peoples feet. Any access is essential in burns, a standard training skill! If the poison was dropped from above (a plane) their hair would have been lost and patches would be evident. Many still had a full heads. Most of the alleged victims presented in ‘Saving Syria’s Children’ are notably calm and quiet. Some mill around in the hospital and its yard. From 33:05 – 33:46 Lutfi Arsi (in the yellow ‘Super 9’ t-shirt) calmly inspects his fellow alleged victims, helpfully directs a member of staff towards them, ambles to the back of the room, pulls up a chair and takes a seat. At 36:52 Anas Said Ali speaks, incongruously, in English (“I’m so bad, so bad”) . Alleged victim Anas Said Ali, allegedly being treated for incendiary bomb burns, speaks in English (“I’m so bad, so bad”) at 36:53 in Saving Syria’s Children. 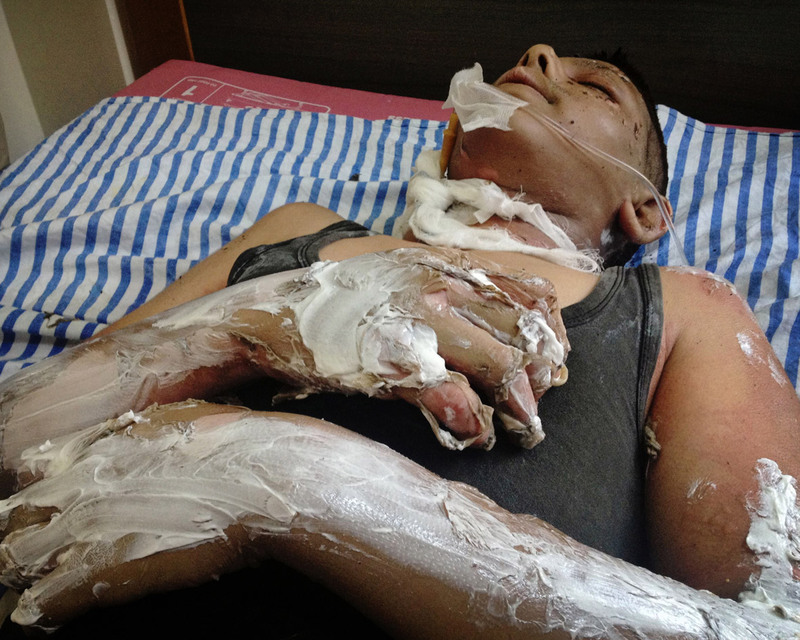 The “victims” presented in ‘Saving Syria’s Children’ appear to have retained their eyebrows, despite white cream suggesting treatment for facial burns. Note in particular the undamaged eyebrows of the alleged teacher in footage shot on the day of the attack and those of Siham Kanbari “a few weeks after the attacks in hospital”. Alleged teacher. Note undamaged eyebrows. 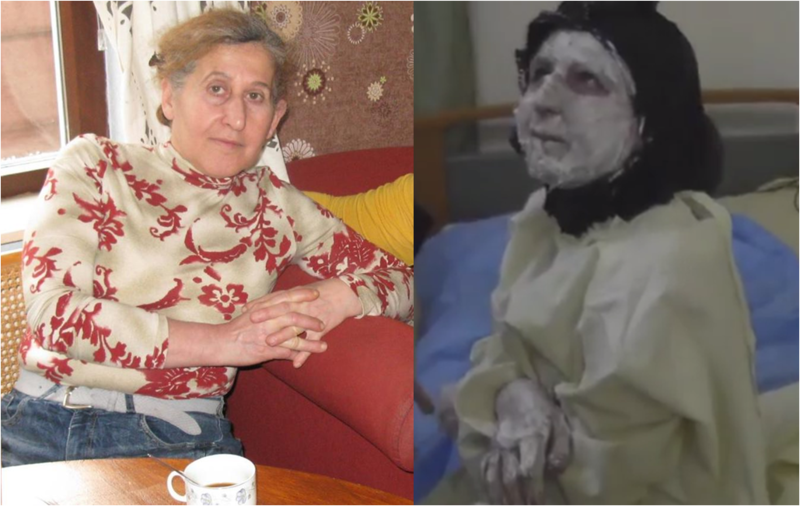 Alleged victim Siham Kanbari “a few weeks after the attack in hospital in Turkey”. (Saving Syria’s Children, 43 minutes). Despite the shocking appearance of her eyes and much of her face, her eyebrows are in pristine condition. See section on HOSPEX injury simulation techniques below. 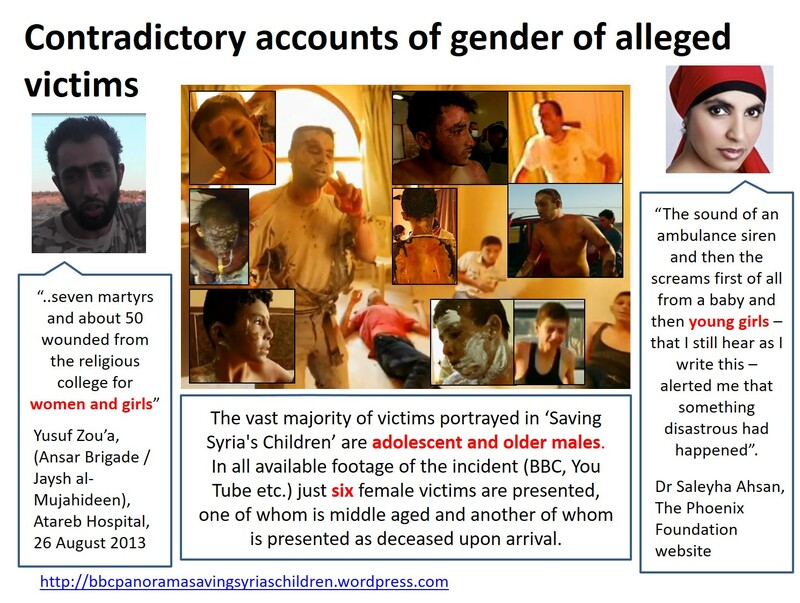 Compare the injuries and demeanour of the alleged victims presented in Saving Syria’s Children with footage of Vietnamese and Egyptian napalm victims. In her decision of 26 September 2014 the BBC Senior Editorial Complaints Adviser cites the opinion of a “consultant plastic surgeon with training and experience in the presentation, prognosis and outcome of traumatic burns injuries”. This opinion does not explicitly take into account the possible use of sophisticated injury simulation programmes such as HOSPEX, discussed immediately below. 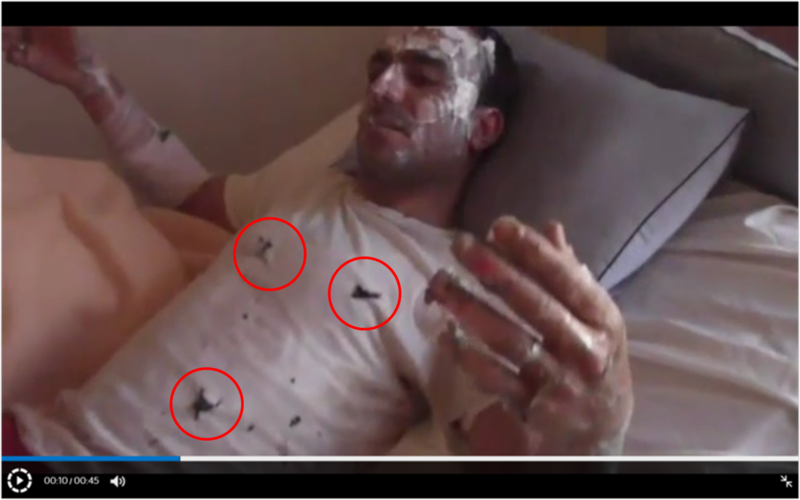 Alleged teacher (note white t-shirt with black marks) swaying and lurching bizarrely from 33:38 to 33:46 in ‘Saving Syria’s Children prior to giving relaxed and cogent interview (see further images below and http://bit.ly/1FcaK3Q). Alleged teacher interviewed here https://www.youtube.com/watch?v=FIybfXUFvdk. 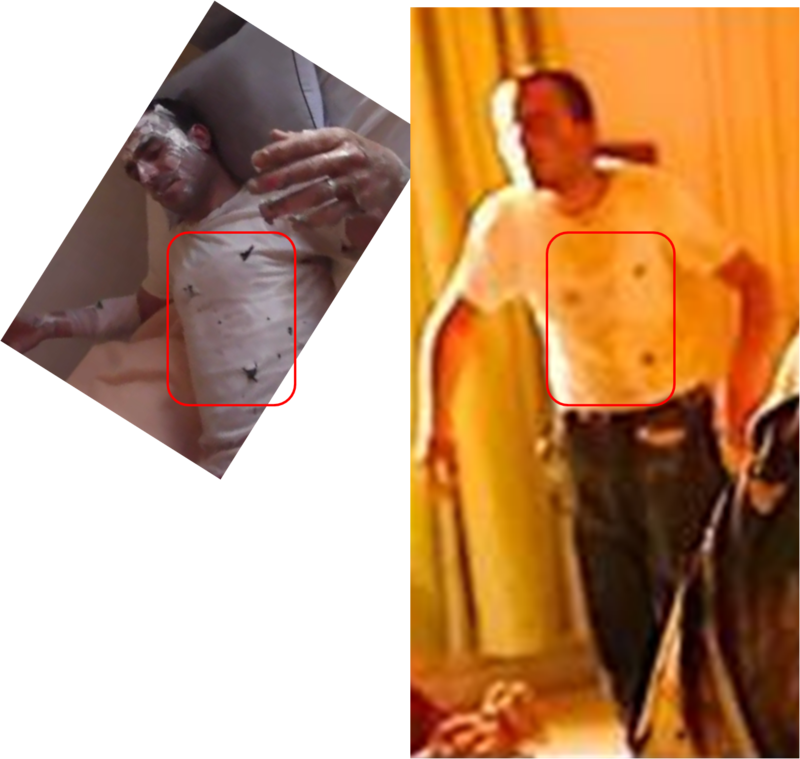 Black marks on t-shirt identify him as the bizarrely swaying figure seen from 33:38 to 33:46 in ‘Saving Syria’s Children’ (see clip above). “The principle behind ‘macro simulation’ is that it’s as close to reality as possible. Actors and make-up artists mimic even the most severe of injuries”. The level of expertise in fabricating injuries and emergency situations demonstrated in this report would appear to be more than adequate to account for the hospital scenes in Saving Syria’s Children. In the report Dr Ahsan states that the officer in charge of the operation, Brigadier Kevin Beaton, was her squadron commander in Bosnia and inspired her to study medicine. 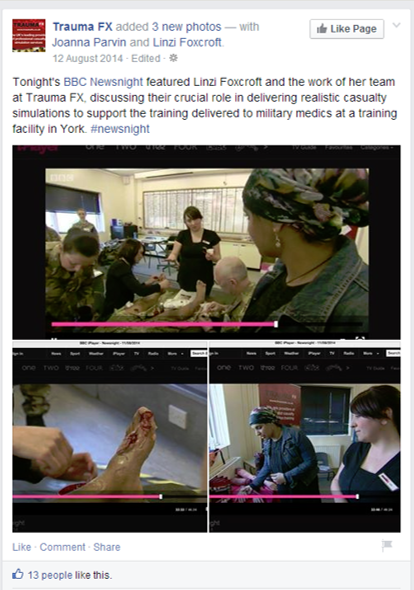 The company which provided the highly sophisticated injury simulations featured in the Newsnight report is Trauma FX, which proudly claims to be “UK’s leading provider of realistic casualty simulation”. Post on TraumaFX’s Facebook page, 12 August 2014. The post has subsequently been deleted: https://www.facebook.com/TraumaFXUK/posts/431784723629501. 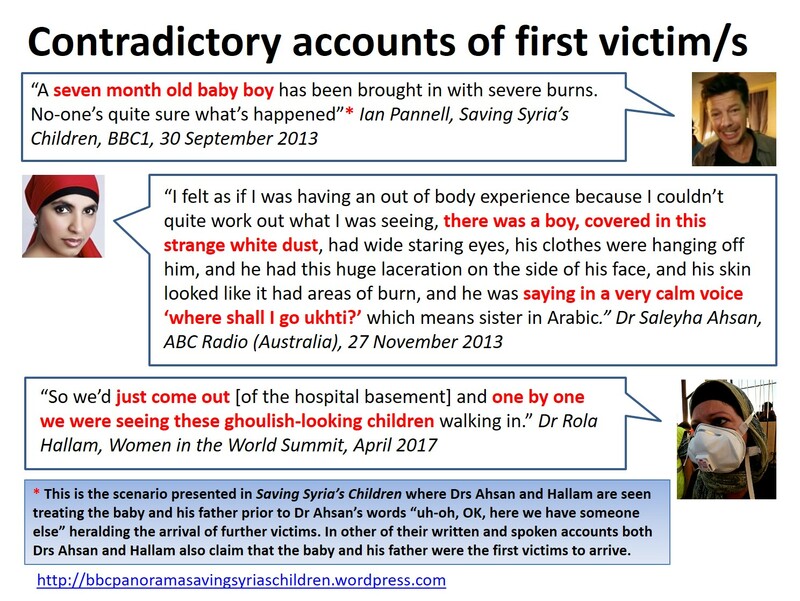 The simulated foot injuries are described in the report as “degloving”, a type of injury presented by several of the alleged victims in Saving Syria’s Children. Alleged “degloving ” injuries in ‘Saving Syria’s Children’. TraumaFX’s website states that it “support(s) various military forces internationally” and “can easily travel international as we are a mobile team and can work in any location”. The company has over 10 years’ experience of supporting UK military training exercises. 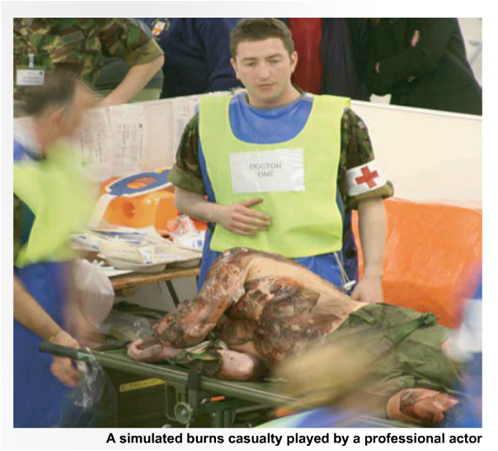 In addition to providing clients with “Casualty Role Play Actors & Amputee Actors” and “SIMWOUNDS” (“practical, realistic” wound effects), TraumaFX is specialist “in simulating CBRN [Chemical, Biological, Radiological and Nuclear] injuries and conditions”. Further examples of Trauma FX’s impressive work can be viewed on the company’s Facebook page. As noted below it may be significant that Atareb hospital staff were attending a battle first aid training course in Turkey on the date of the alleged napalm bomb attack. Fuller details here. See also Who are these men? A western male in a grey shirt and spectacles appears at 2:06 in the BBC News report of 30 September 2013. He is carrying a camera and ducks out of sight as he realises that he is in shot with the BBC’s interview with Dr Rola Hallam. Elsewhere in the BBC’s footage he can be seen communicating by walky-talky. 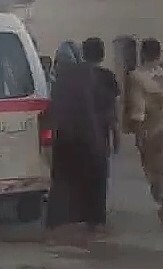 The presence of this person is perplexing, as at no point in its correspondence has the BBC suggested that the Panorama crew in Syria at that time consisted of anyone other than reporter Ian Pannell, cameraman/producer Darren Conway and fixer/translator Mughira Al Sharif, plus presumably local drivers/minders. In an appeal review request of 28 December 2014 another complainant directly asked the BBC to identify the man in the images below. In its rejection of this request the BBC Trust’s Editorial Standards Committee ignored this question, along with several other potentially significant points. Update: The editor of Panorama ‘Saving Syria’s Children’, Tom Giles, has commented angrily here, speculating that the man may be a BBC News safety advisor. Update: Further scrutiny of footage from the events of 26 August 2013 has revealed several other figures holding or using walkie-talkies – see Who are these men?. Update: The male in the grey shirt and spectacles seems to be the same person who can be seen accompanying Ian Pannell at 42 seconds in this earlier BBC News report (see screencap below). This would appear to endorse Tom Giles’ speculation that the man may be a BBC News safety adviser however it may not explain why he would be carrying a camera nor his concern, during an alleged mass casualty situation, to avoid interrupting a filmed interview with Dr Rola Hallam. 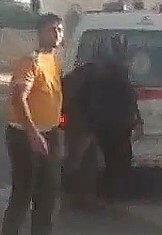 At 21 seconds in the below You Tube video (higher quality source copy here) shot outside Atareb Hospital, Aleppo on 26 August 2013 a white male can be glimpsed snatching a piece of patterned fabric from the back of a pickup truck. Moments later a hand – perhaps belonging to the same man – is seen flicking a dark sheet over an unseen object in the truck. 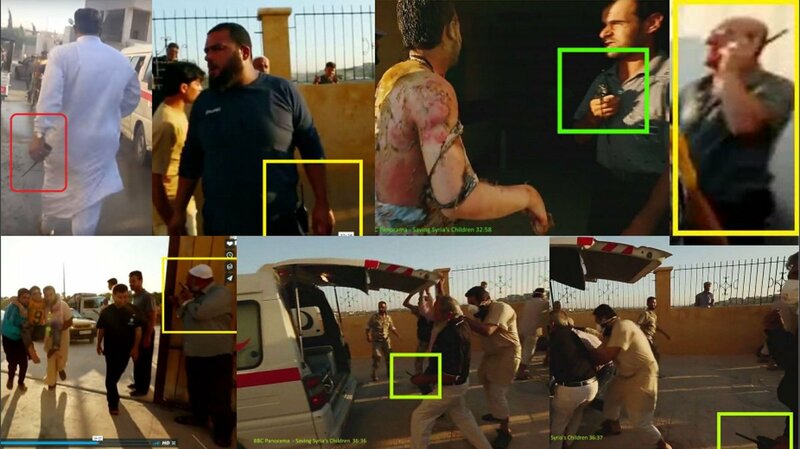 The presence of a militarily attired westerner at the Aleppo hospital to which alleged victims of the alleged Urm al-Kubra napalm attack were transported would appear highly incongruous. Further details here. See also “Napalm bomb” school located. From 2:38 to 2:44 in Ian Pannell and Darren Conway’s BBC Ten O’Clock News report of 29 August 2013 a group of four people, including a woman in a black dress with a distinctive gold flower pattern, rushes through Atareb Hospital gate, interrupting an interview with Dr Rola Hallam. Darren Conway’s footage featuring a woman in a distinctive black dress, also shown in Saving Syria’s Children (36 minutes). 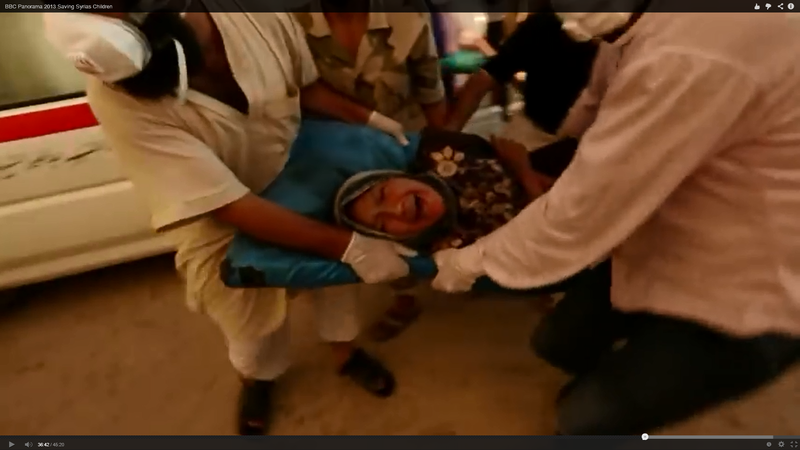 A longer version of the sequence appears at 36 minutes in Saving Syria’s Children, immediately followed by a brief “flashback” shot of the woman’s arrival at Atareb Hospital, in which she is seen being stretchered on a mattress out of the back of an ambulance by five men, apparently screaming in agony. 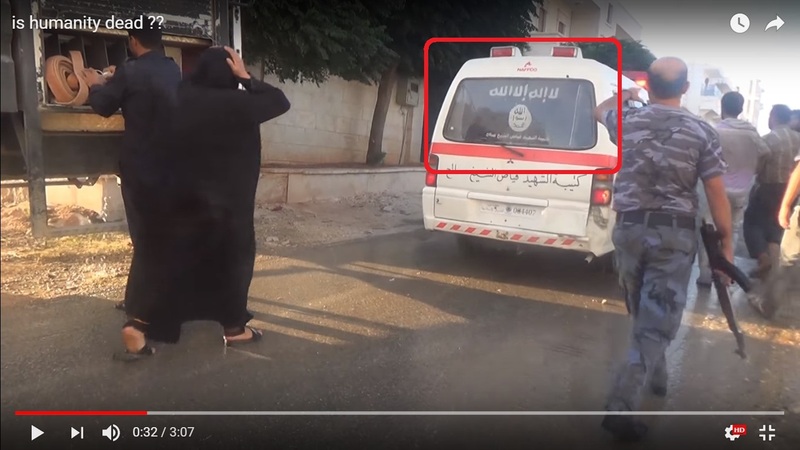 In marked contrast to her apparent condition upon arrival , video footage shot at Urm al-Kubra on the day of the alleged incendiary attack shows the woman walking calmly and unaided towards the ambulance (Video A, 7 – 12s). After presumably entering via the two steps at the vehicle’s side entrance, she then appears seated upright (Video B, 7 – 11s) as she embarks upon the short (approximately 13 km) journey to Atareb Hospital, where she was filmed by Conway. 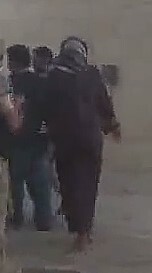 The woman in the black and gold dress, who was presented as an incendiary bomb victim in the BBC News report of 29 August 2013, walks towards ambulance calmly and unaided, prior to taking an upright seat. 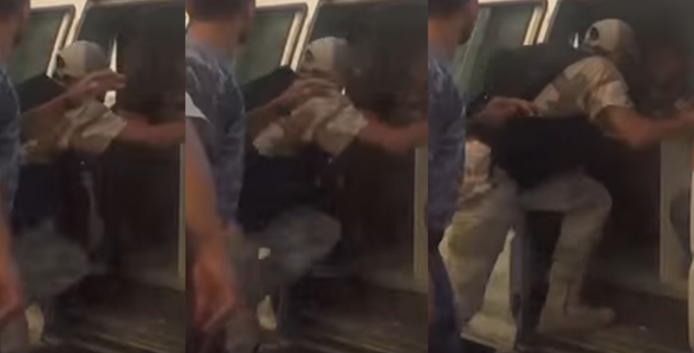 There can be no doubt that Video A and Video B both relate to the same alleged events reported by the BBC and that the woman entering the ambulance in Video A is the same person who is carried out of it in the BBC’s footage. 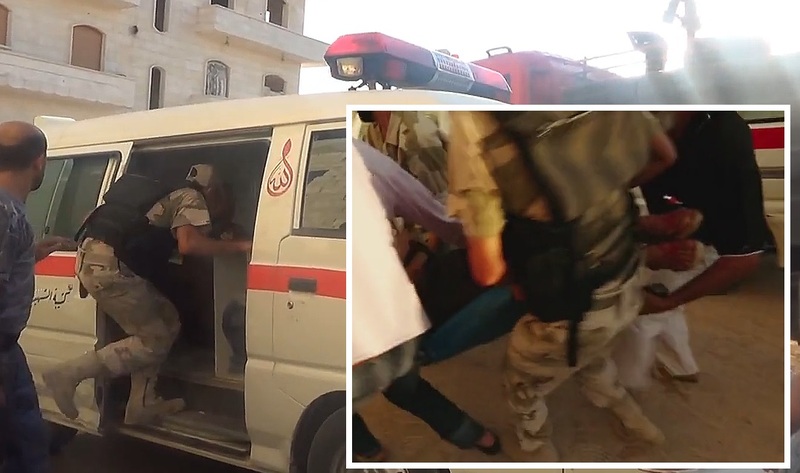 (Left) Man in combat fatigues with rolled up sleeves and trousers accompanies woman in black dress into ambulance at 9s in Video A; (Right) Same man, identifiable by camouflage pattern on clothing, helps to carry the woman out of the ambulance upon her arrival at Atareb Hospital at 36:39 in Saving Syria’s Children. 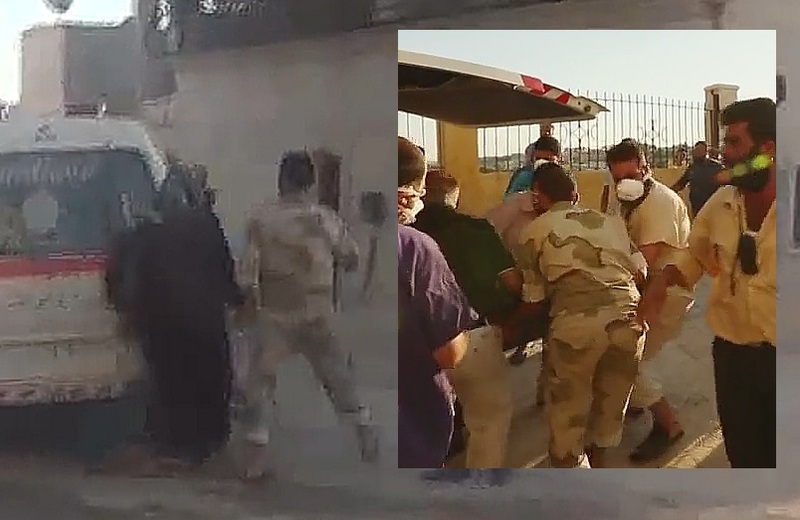 (Left) Man in combat fatigues, cap, dark body vest and carrying weapon boards ambulance at 8s in Video B and at 40s in Video A; (Right) Same man assists in carrying woman from ambulance at 36:43 in Saving Syria’s Children. 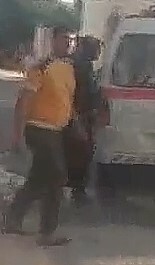 Both men board the ambulance on its right side; both are initially in the rear with the woman in the black dress before the man with rolled up sleeves and trousers climbs out and gets into the front passenger seat (Video A, 36s). 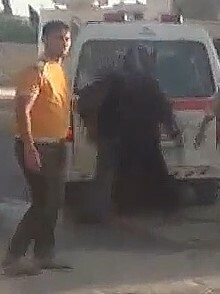 Upon arrival at Atareb Hospital both men exit the ambulance on its right hand side and both assist in carrying the woman in the black dress out through the tailgate. 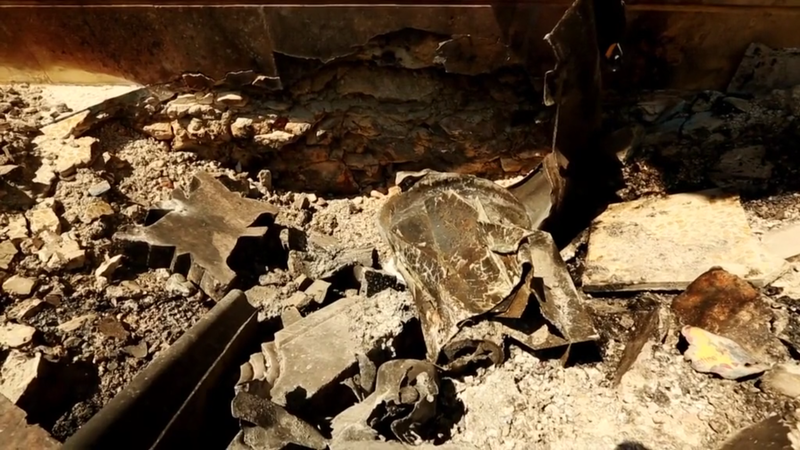 We don’t know for sure what was in the bomb, but the injuries and debris suggests something like napalm or thermite. the bomb weighed 1,100lbs and contained a fuel similar to napalm. Posts on The Syrian Archive refer to a “phosphine chemical attack” while captions beneath images taken by photographer Amer Alfaj relate “opposition” claims of “Napalm and White Phosphorous”. 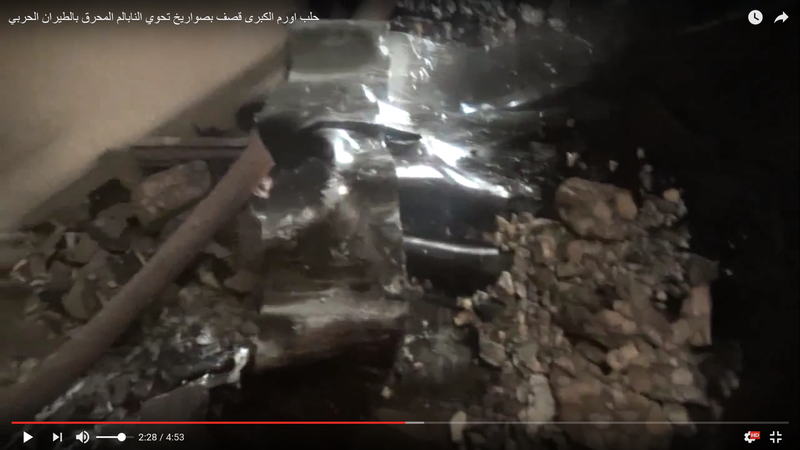 Below are a number of images from the two alleged incendiary attack locations, taken from several videos and still images. Some readers may be better placed than I to assess which, if any, of the above claims are consistent with the munitions remnants pictured. 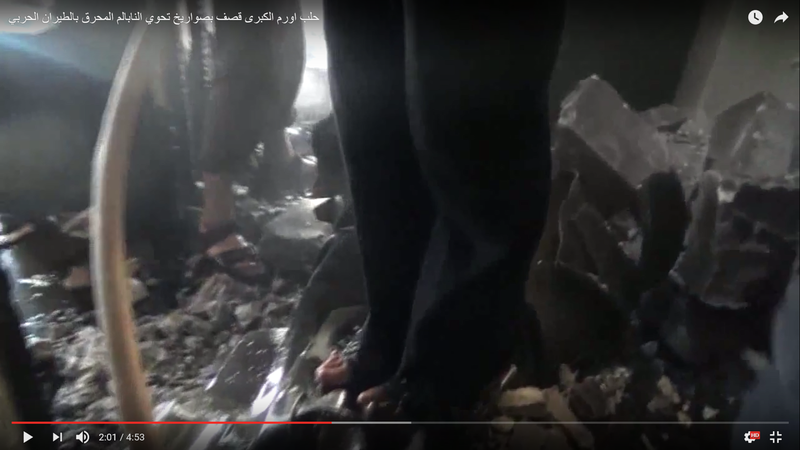 Note that in Video D – uploaded to You Tube a day after the alleged incendiary attack – the munition casing is handled freely (see first gallery below) and that in Video A – apparently shot on the day of the attack itself – one of those present has no qualms about standing on a munition casing in his bare feet (see second gallery below). 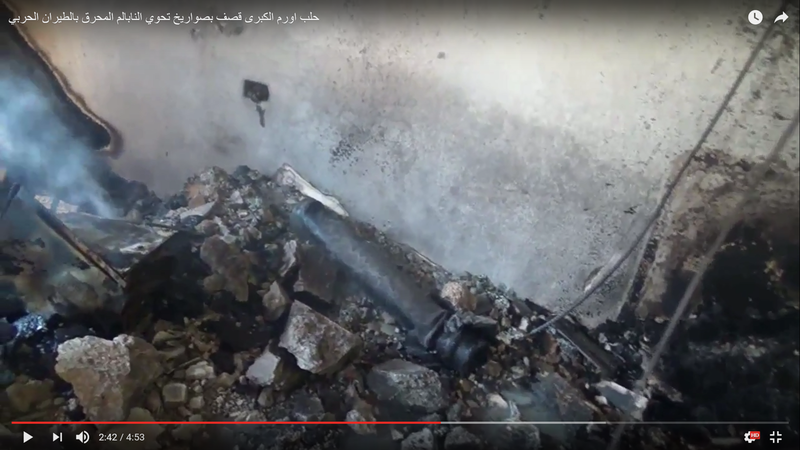 Images of munition remnants at the school, variously from Video C, Video D, Saving Syria’s Children (41:33) and photographs taken by Dr Saleyha Ahsan and posted on The Phoenix Foundation website. 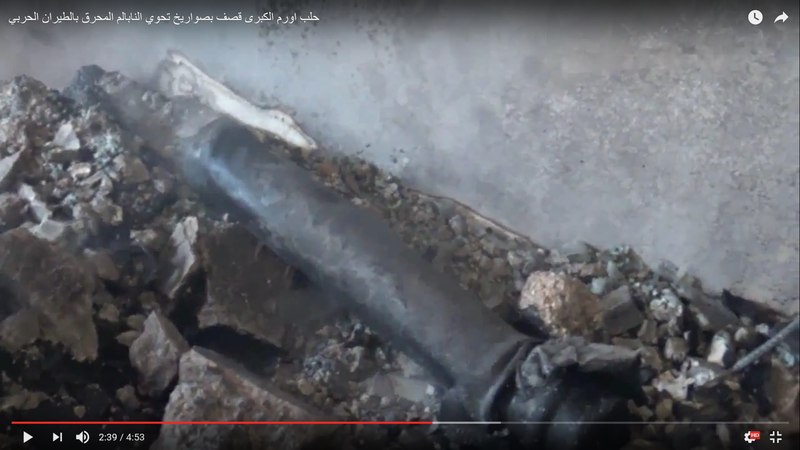 Images of munition remnants at bombed building, Video A. This information was submitted to the BBC on 13 October 2014. A team of Syrian investigators which has been researching the alleged attack has been in contact with a former commander of the Al-Tawhid Brigade who was based in Aleppo province in August 2013 and who was in close contact with events in Urm Al-Kubra. The team has provided me with the commander’s name. We the fighters of the Free Syrian Army in the North West areas of the City of Aleppo we declare that we were present in this region in August 2013 and we did not meet any air strike with the substance of Napalm on Urum al Kubra or on any other region in the North West Aleppo countryside and we deny the cheap fabrication of the BBC and of the stations that imitate her because it undermine the credibility of the Free Syrian Army. Saying this we do not hesitate to criminalize the criminal acts of the Assad regime and its murderous extermination of its people. And we have done a field investigation with the help of the delegate of the Free Syrian Red Crescent and this has conducted us to confirm what we are saying : no victims, no traces and no memory with anybody of the alleged air strikes with the substance of Napalm. The commander has agreed to provide a full statement to the BBC providing that his identity is protected. He is also willing to testify publicly under appropriate international protections. The commander, who is now attached to another faction allied to the Free Syrian Army, has offered to provide BBC journalists with safe transit from Antakya, Turkey to Urm Al-Kubra to interview witnesses assembled by the Syrian team and to conduct their own investigation. 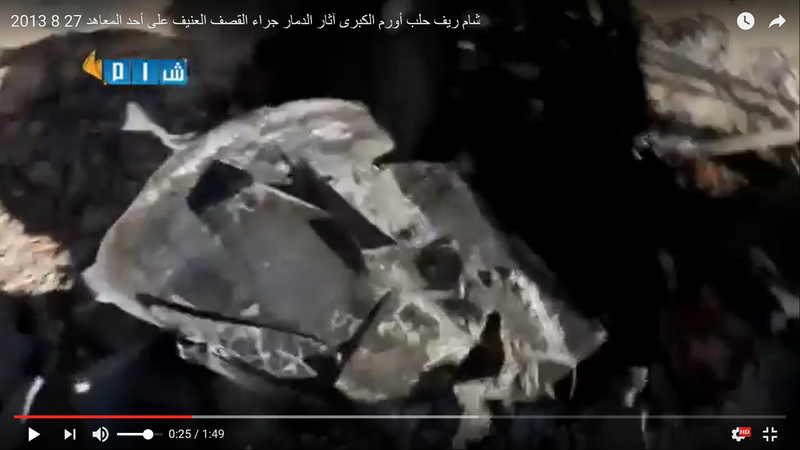 A July 2014 telephone conversation between two members of the Syrian investigative team, transcribed here, provides an account from a local resident who also affirms that the alleged napalm bomb attack did not occur. This information was submitted to the BBC on 2 September 2014 and 13 October 2014. Fuller details here. See also Have journos (and filmmakers) passed up the Beatles of all scoops?. A 51 year old Dutch-Armenian woman (first two images below) contacted me through Facebook in June 2014 to request that I remove a screengrab from ‘Saving Syria’s Children’ which I had posted on the site, claiming that she was in it and that she did not wish others to see it. Although the woman was not featured in the particular image I had posted, I interpreted her words as possibly meaning she had been photographed or filmed at Atareb hospital on 26 August 2013, the day of the alleged attack. The woman did not respond to my requests for clarification. The woman’s Facebook page reveals that in 2012 she travelled between Syria and the Netherlands, where she resides. There is a gap in her Facebook posts in the weeks around 26 August 2013. 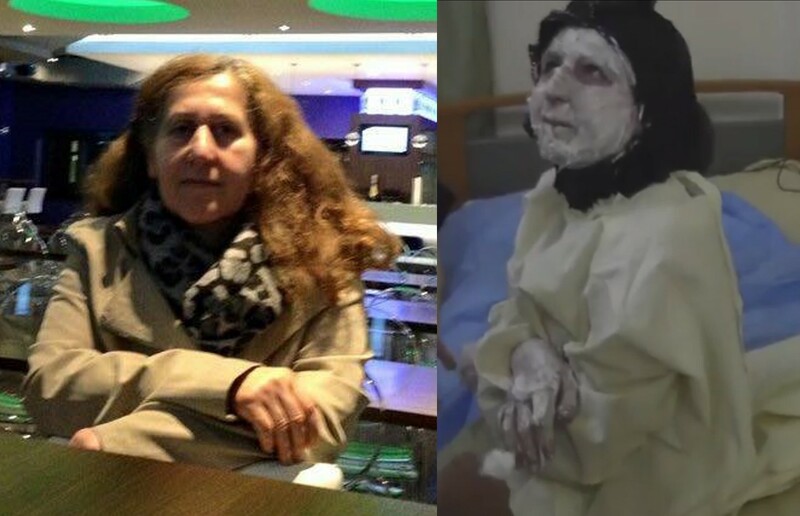 Some weeks after she had contacted me I came across this You Tube video shot at Atareb hospital on 26 August 2013 in which at 20:36 a woman is briefly seen having white cream applied to her face and hands (third image below). The resemblance between this person and the woman who contacted me is extremely striking. Update, April 2016: Further images of the woman who contacted me are currently viewable on the Facebook account of one of her relatives. Two are reproduced below. The first is dated 10 January 2015 and tagged “in Netherlands”. The second is dated 22 October 2014 but appears to have been taken some years earlier. I have cropped the woman’s relative out of both images. Compare with the woman from the You Tube video. Posted on Facebook 22 October 2014, although likely taken some years previously. Comparison of Dutch-Armenian woman who contacted me on Facebook expressing anxiety at being identified in Atareb Hospital footage and alleged victim filmed at Atareb Hospital on 26 August 2013. Update, July 2018: Further images of the woman from Facebook, such as the one on the left below, bear a striking resemblance to the woman present at Atareb Hospital on 26 August 2013. 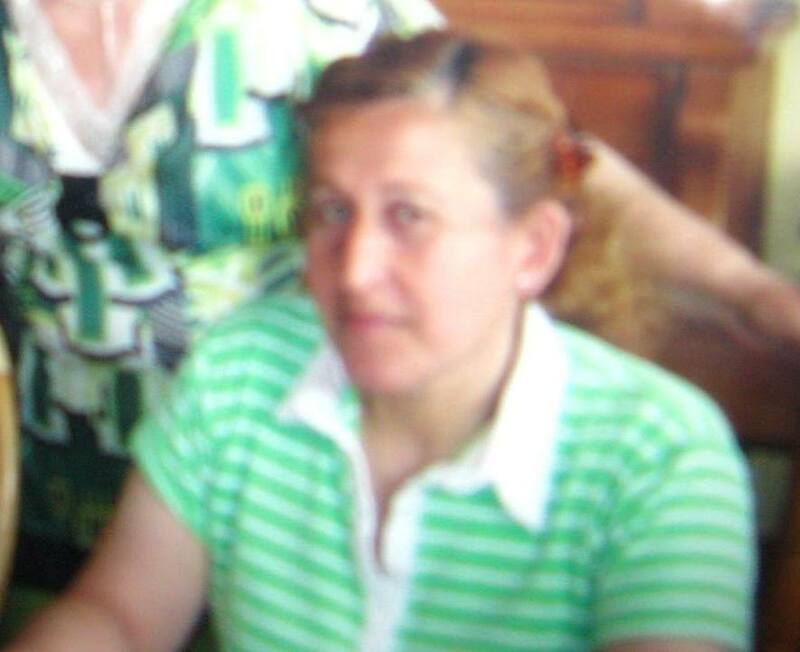 Facebook image dated August 2016 of the Dutch-Armenian woman who contacted me on Facebook again compared with alleged victim filmed at Atareb Hospital on 26 August 2013. Dr Rola Hallam, who features throughout Saving Syria’s Children, is described as “a British doctor visiting for the charity Hand in Hand for Syria”. 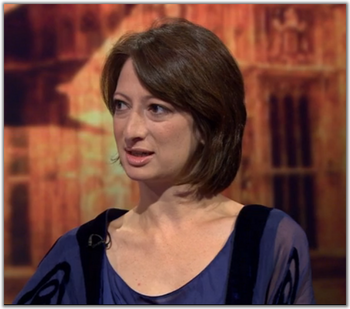 On 30 August 2013, the day after the first BBC report on the alleged attack, Dr Hallam appeared on Newsnight expressing her disappointment at parliament’s rejection of a military strike against Syria. Dr Hallam’s father is Dr. Mousa al-Kurdi. According to a February 2013 article written Dr Hallam’s colleague, Dr Saleyha Ahsan, Dr al-Kurdi is “involved politically with the Syrian National Council”. In an Al Jazeera interview Dr al-Kurdi passionately advocates for the Syrian National Council’s recognition as the “sole representative” of all Syrians and relates how, following his address to the Friends of Syria summit in Istanbul in 2012 (attended by Hillary Clinton), he told Turkish Foreign Minister Ahmet Davutoğlu “You’re not doing enough” and demanded of Professor Davutoğlu and several other foreign ministers, including Victoria Nuland of the US State Department, “either you defend us or you arm the Syrian Free Army to defend us – you have the choice”. At a Save the Children event in November 2013 Dr Hallam stated that her father “is certainly not a member of the Syrian National Council; he is a gynaecologist, who like most Syrians has taken an interest in what’s happening in his country”. Dr Hallam is a member of the charity Hand in Hand for Syria’s executive team. Hand in Hand’s original three-star logo is plainly based on the flag adopted by the Free Syrian Army and the Syrian National Council. In 2014 the charity removed the stars from its logo. The UK Charity Commission’s website states that Hand in Hand for Syria exists for “the advancement of health or saving lives”. Until July 2014 the Facebook banner of Hand in Hand’s co-founder, Faddy Sahloul, read WE WILL BRING ASSAD TO JUSTICE; NO MATTER WHAT LIVES IT TAKES, NO MATTER HOW MUCH CATASTROPHE IT MAKES. 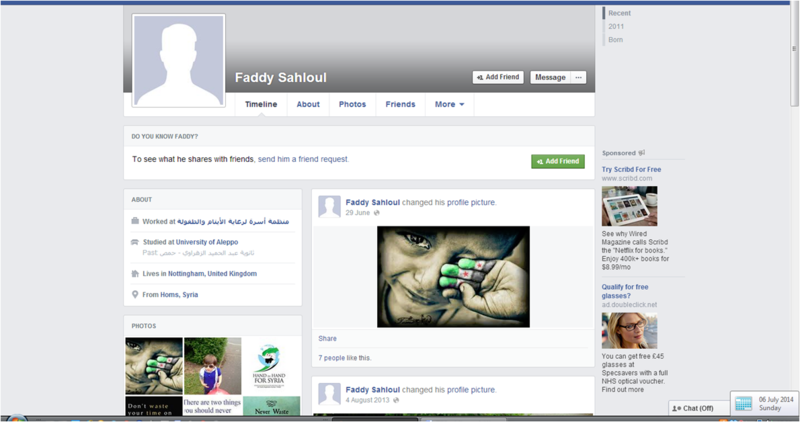 Mr Sahloul’s bloodthirsty sentiments were “liked” on Facebook by Hand in Hand’s other co-founder, Fadi Al-Dairi. Mr Sahloul and Mr Al-Dairi are listed as Trustees of Hand in Hand for Syria on the Charity Commission website. The image was removed shortly after it was commented on publicly. 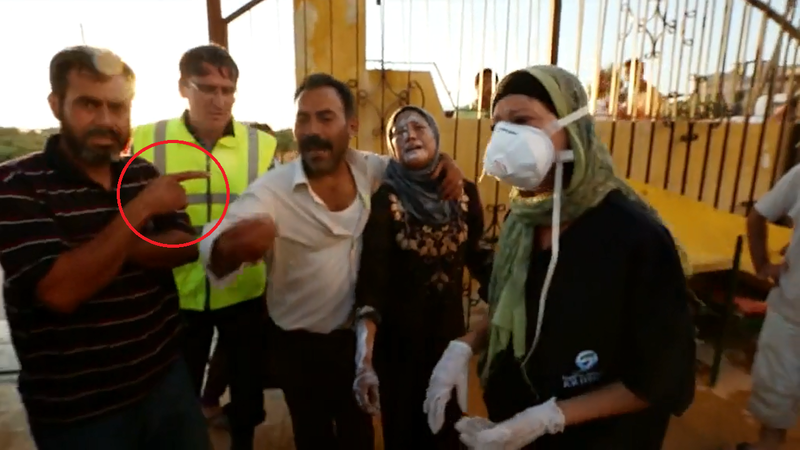 A nurse seen treating the alleged incendiary bomb victims alongside Drs Rola Hallam and Saleyha Ahsan in ‘Saving Syria’s Children’ was subsequently photographed at Atareb Hospital wearing a Hand in Hand for Syria tunic and ostensibly tending to the injuries of a child “rebel” combatant. The web article which hosts the photograph overtly celebrates the fifteen year old’s supposed battle prowess. (See footnote , as well as here and here for further details). The word “HAND” is visible on the nurse’s tunic. 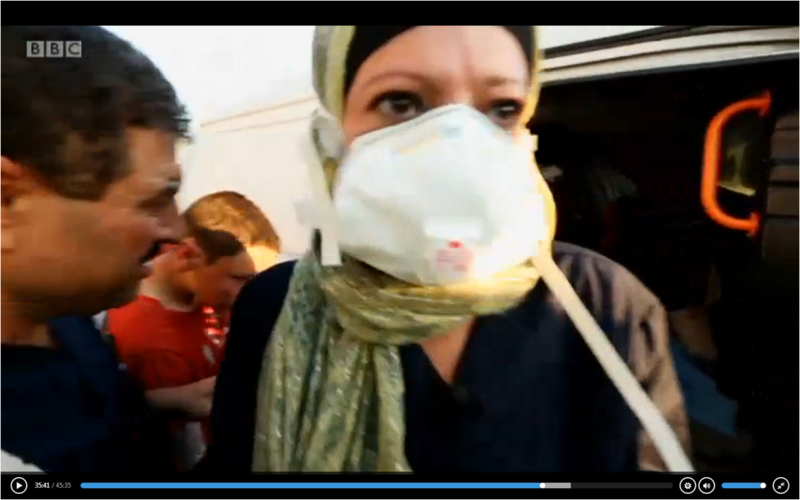 The same nurse (centre) appeared alongside Hand in Hand for Syria executive Dr Rola Hallam (left) and former British Army captain, freelance filmmaker, BBC presenter and Hand in Hand for Syria volunteer Dr Saleyha Ahsan (right) in scenes filmed at Hand in Hand for Syria’s Atareb Hospital in Aleppo and broadcast in the 2013 BBC Panorama special ‘Saving Syria’s Children’. In September 2015 I formally raised a number of the above concerns with the Charity Commission. 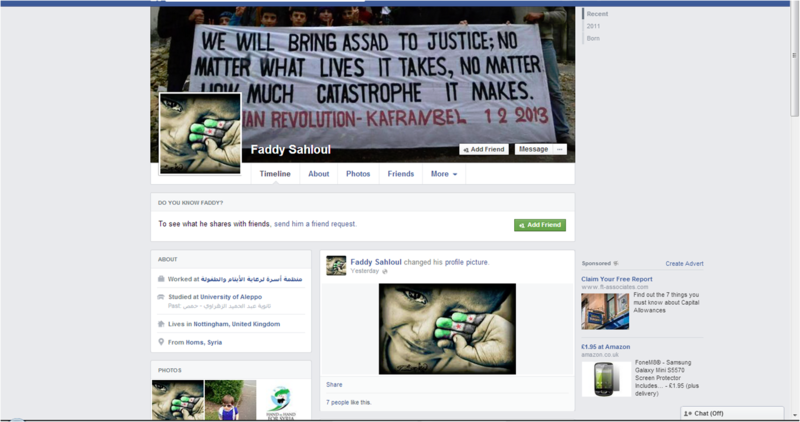 The Commission found that Hand in Hand’s use of the Syrian opposition flag as its logo and its co-founder Faddy Sahloul’s posting on Facebook of “a political statement that potentially promoted violence against the Assad regime” were “historical issues that have since been addressed by the trustees”. 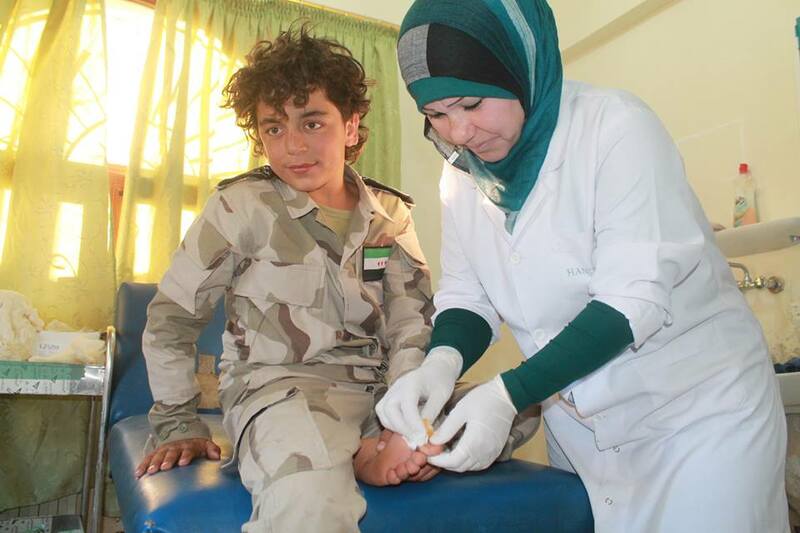 The images of the Hand in Hand nurse apparently treating a child fighter were not considered “sufficient verifiable evidence to substantiate… …concerns” that Hand in Hand for Syria “is celebrating or supporting violence”. 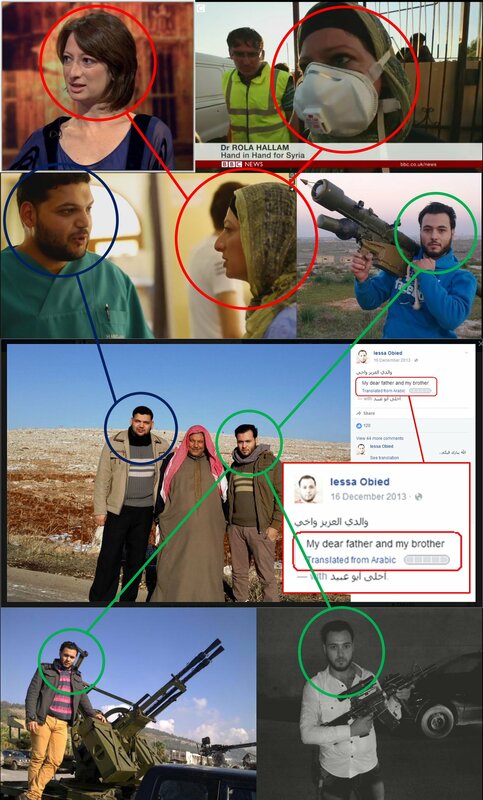 In March 2016 I submitted a further complaint including the below images of Atareb Hospital employee Iessa Obied (brother of Atareb Hospital’s Medical Director Abdulrahman Obied) posing with a shocking array of armaments; in some of the images Obied can be seen wearing a Hand in Hand for Syria tunic. The Commission found that these images “do not raise sufficient regulatory concern“. 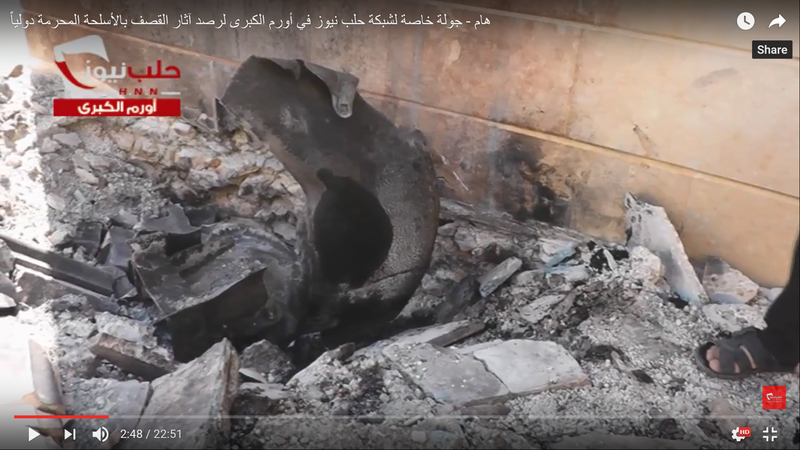 Other images on social media show Obied associating with an employee of another Syrian hospital (Bab al-Hawa) who was photographed attending the preparation and launching of a “Hell cannon” improvised mortar. “I think it was implicit that the charity was working in an area of Syria controlled by the opposition and would therefore be likely to share its aims and objectives (as opposed to supporting the Syrian government).” BBC Editorial Complaints Unit Provisional Finding, 23 April 2014 (see p10 of download). Further questions about the financial affairs and political affiliations of Hand in Hand for Syria have been raised in this dossier compiled by peace activist Dr Declan Hayes. Two You Tube videos: Inside the BBC’s Uprising: Hand in Hand for Propaganda and WANTED: Evidence Hand in Hand for Syria is Really in the Business of Saving Lives also pose questions about Hand in Hand for Syria’s ethics and motivations. In June 2014 Hand in Hand for Syria launched a fundraising campaign which identified the hospital featured in ‘Saving Syria’s Children’ as Atareb Hospital, Aleppo. This makes clear that funding for Atareb Hospital – “from a European donor”, “via an INGO partner” – was secured prior to Ian Pannell’s description (03:17) of it as “a basic hospital funded by handouts”. 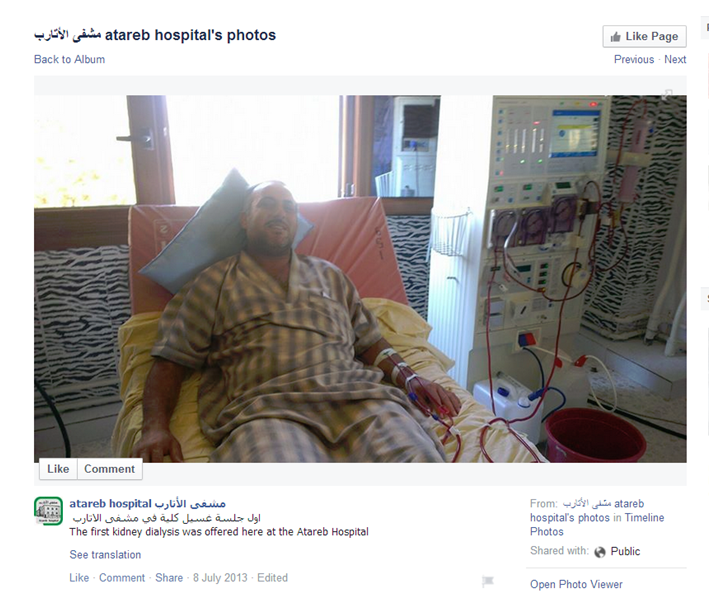 Indeed, images on the Atareb Facebook page posted before 26 August 2013, the day of the “napalm bomb”, depict a relatively well-equipped facility, including a kidney dialysis machine and surgical and x-ray facilities. (Please note there are some highly distressing images on the Atareb Facebook page). The campaign page states that Atareb “now offers 68 beds and a wide range of services – from maternity and neo-natal facilities to many outpatient departments, three excellent operating theatres and a laboratory”. Elsewhere, Atareb is described as “One of the country’s most sophisticated remaining hospitals” with operating costs, according to Dr Hallam, of “between $60,000 and $70,000 a month”. Atareb’s current facilities are further indicated in the campaign materials. Update: In his 2016 book Today We Drop Bombs, Tomorrow We Build Bridges: How Foreign Aid became a Casualty of War, Peter Gill reveals: “The Hand in Hand hospital at Atareb was funded by the the British medical charity Merlin but faced a crisis when Merlin became part of – was essentially taken over by – Save the Children in 2014. Save the Children gave Hand in Hand notice it would not be extending its support for the hospital beyond the middle of the year. ‘It was a painful decision to make,’ one of their managers told me, ‘because of course we’d all seen the Panorama documentary. '” (See extended extract on Google Books here). Post on Atareb Hospital’s Facebook page showing a new dialysis machine in use over one month prior to Ian Pannell’s description of Atareb as “a basic hospital funded by handouts”. 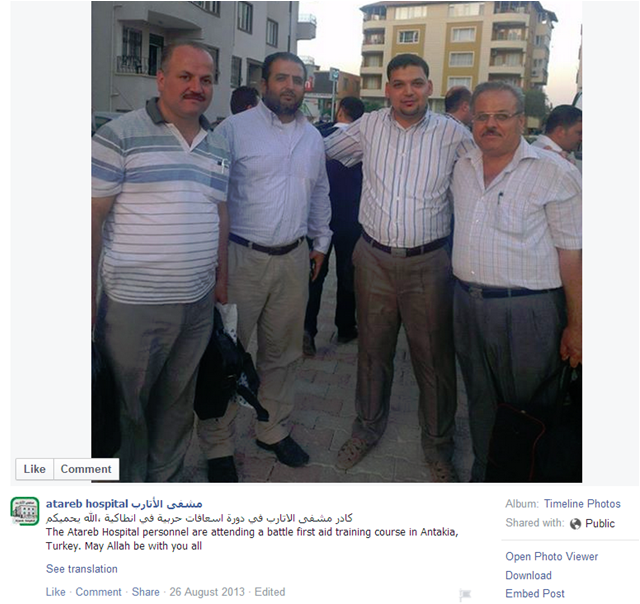 A post on Atareb Hospital’s Facebook page shows that on 26 August 2013, the date of the alleged attack, hospital staff were “attending a battle first aid training course in Antakia, Turkey”. 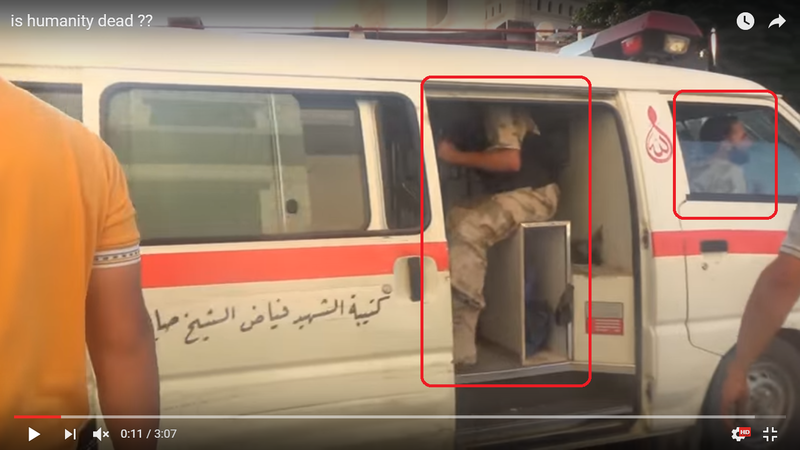 This may indicate that some of the medics filmed by the Panorama team were not regular Atareb staff members. A report by the Violations Documentation Center in Syria (a regularly cited BBC source) links to a list of 41 alleged victims of the attack. Several of the names are identifiable as those ascribed to individuals featured in ‘Saving Syria’s Children’, however their date of death in all cases is given as 26 August 2013. While this reflects the Panorama account in respect of Lutfi Arsi (Loutfee Asee on the list), whom the BBC claims “died on his way to hospital in Turkey”*, it contradicts it in respect of Anas Sayyed Ali (Anas al-Sayed Ali), whom the BBC claims “died a few days later in hospital in Turkey” and whom Dr Ahsan states (p15) died “two weeks later”; Ahmed Darwish (Ahmad Darwish), who was filmed by Panorama “a few weeks after the attack in hospital in Turkey”; Siham Kanbari (Siham Qandaree), also filmed later in the same hospital and whom Dr Ahsan has stated died on 20 October ; and Mohammed Asi (Muhammad Assi) who is pictured in an image provided by BBC Audience Services “two weeks after the attack in hospital in Turkey”. The list includes a Muhammad Abdullatif, age 15. Mohammed Abdullatif is the name of the adult eyewitness who appears in the 29 August 2013 BBC News report (02:54) and in this non-BBC footage of the same “interview”. * Update February 2017: Images have emerged which contradict the BBC’s claim that alleged victim Lutfi Arsi “died on his way to hospital in Turkey”. See above and this post for details. Update July 2018: Further references to some of the alleged victims can be found on the website of the Damascus Center for Human Rights Studies. See search results for Orm Al-Kubra and click through to results for 26 August 2013 and subsequent dates. I will analyse this data in due course. 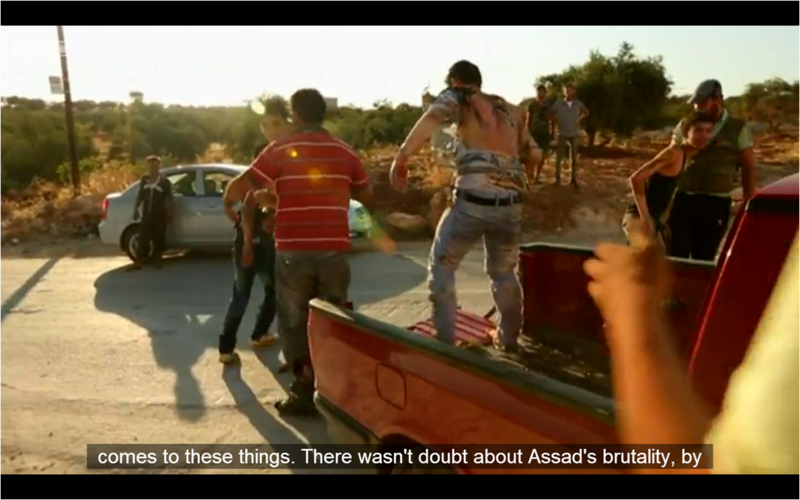 The collection of videos of the alleged events of 26 August 2013 assembled by the “Free Halab” blog poses further questions as to the veracity of the BBC’s account. (Update: the Free Halab blog has been marked private, however a mirror site exists here). 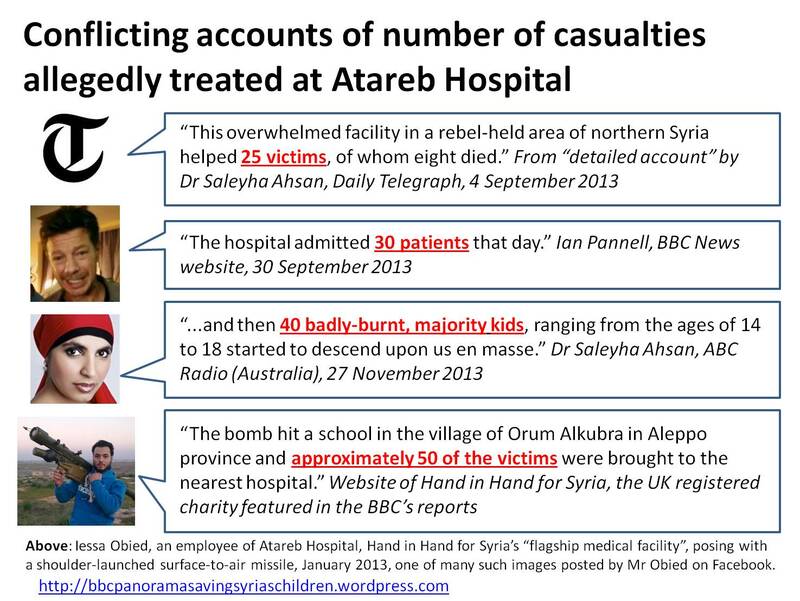 A number of videos from Atareb Hospital on 26 August 2013 are also compiled here. At 02:08 in the 29 August 2013 BBC News report Mohammed Asi is shown climbing down from a truck, accompanied by Dr Ahsan’s words “more coming? More? More?” However Asi had already been shown walking into the hospital from 01:44. At 34:08 in ‘Saving Syria’s Children’ the narration states “within minutes the hospital is overwhelmed” over footage of Lutfi Arsi being carried into the hospital. However this is Arsi’s third appearance in the programme, having previously been seen at 32:26 and from 33:05 – 33:44. 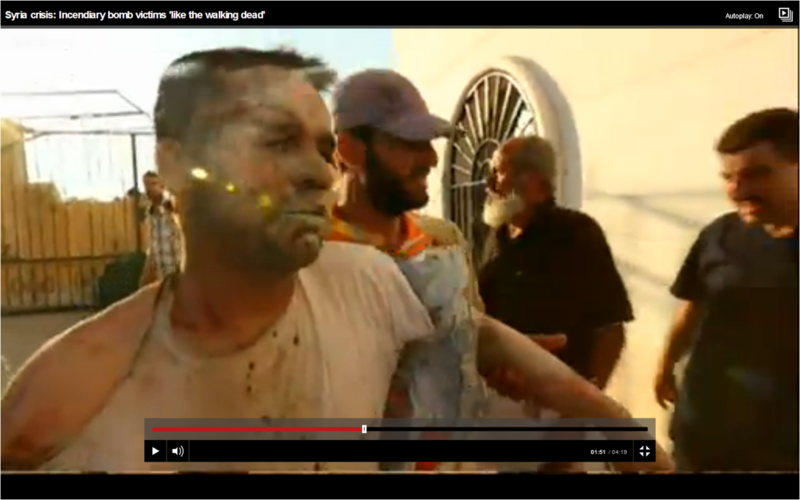 Victim X is shown arriving in the hospital yard at 35:35 in ‘Saving Syria’s Children’, heralded by Dr Ahsan’s words “I think there’s more coming, I think there’s more coming”, despite his having previously seen being “treated” inside the hospital from 34:36 – 34:55. A woman exclaims “yama yama yama” as she enters the hospital at 34:02; the same audio clip is also used over footage of Victim Y entering the hospital at 31:44. …the programme-makers felt they were justified in using footage out of chronological order “to show the mayhem and the mood of what was happening around”. I am satisfied that the editing would not have affected the audience’s overall impression of what took place. 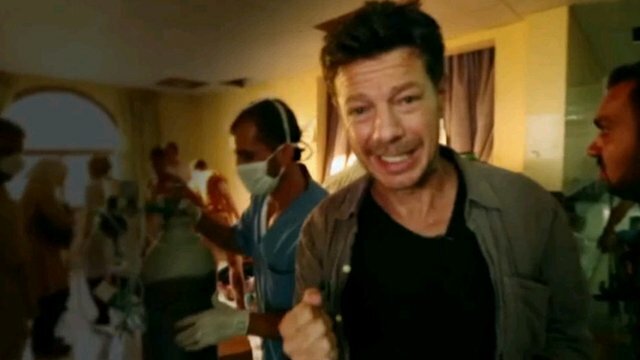 In a contemporary BBC World Service report Ian Pannell states (at 3:06) “Fathers and mothers, desperate for help, fought to be allowed into the hospital, cursing their president Bashar al-Assad”. However the cries and rants heard at this point are those of the alleged father and mother of the woman in the black dress seen at 2:37 in the BBC Ten O’Clock News report of 29 August 2013 (compare audio). 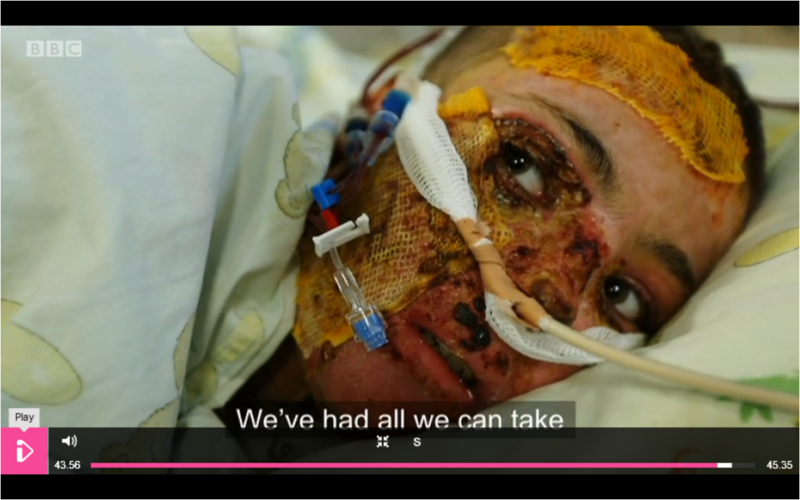 On 23 April 2014 the BBC explained (pp 6 & 7) that in this sequence the woman had already been treated inside the hospital with white burns cream. She then “went back outside” (to be evacuated to a Turkish or border hospital according to Dr Saleyha Ahsan) prior to rushing back through the hospital gate (at 36 minutes in Saving Syria’s Children) with her family to declaim Assad to the BBC camera. To say that the family was at this point fighting “to be allowed into the hospital” is therefore false. Furthermore, none of the alleged victims in ‘Saving Syria’s Children’ are seen fighting “to be allowed into the hospital” – they are carried or walk inside, entirely unimpeded. In his BBC web article of 30 September 2013 Pannell repeats the claim that “Fathers and mothers” “fought to be allowed into the hospital” but here substitutes the phrase “desperate for help” with “desperate for news”. 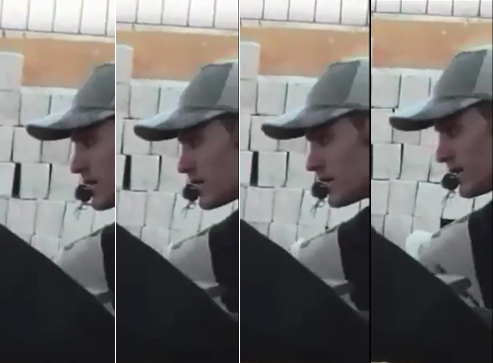 The medic, still wearing the same blue tunic, provides a seven minute interview for the Aleppo News Network the next day , during which he appears to demonstrate barely concealed amusement (from 12:58 to 13.00 and, more markedly, from 17:22 to 17:29 – see sequence below). This seems highly incongruous in someone who had supposedly spent the previous day tending to, according to Dr Ahsan, “up to 40 severely burned people with up to 70 to 80 percent burns, second to third degree”. The so called MD with his neat and clean overhaul [sic] said that they were listening through a walky talky to the pilot conversation with the command center (ask any army veteran to tell you how impossible this was). Update: the medic has been linked to the White Helmets – see Saving Syria’s Children: the White Helmets connection (Part II) and section immediately below. 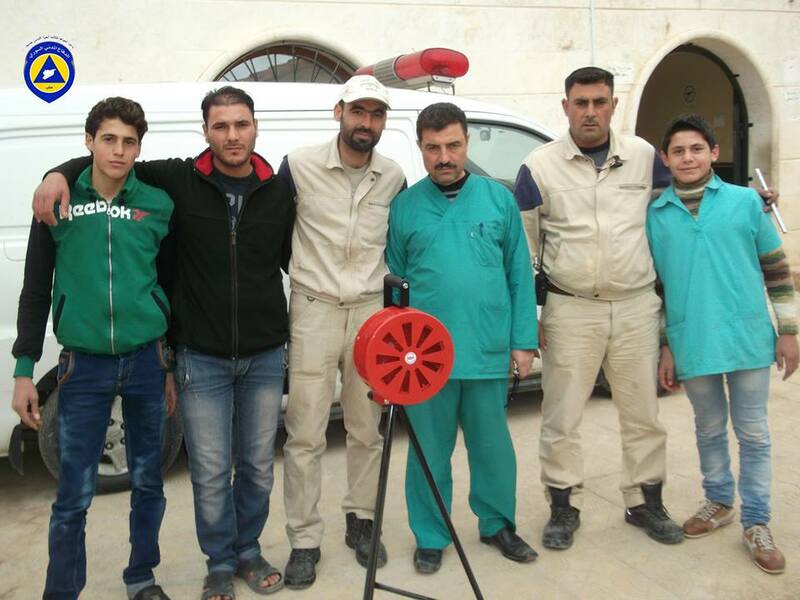 Above: medic (third from right) in Atarab White Helmets Facebook post, 20 November 2014. Scrutiny of sequences in Saving Syria’s Children reveals that senior members of the White Helmets, including the organisation’s Deputy Director Mounir Mustafa, were present at Atareb Hospital on 26 August 2013. See here and here for full details. 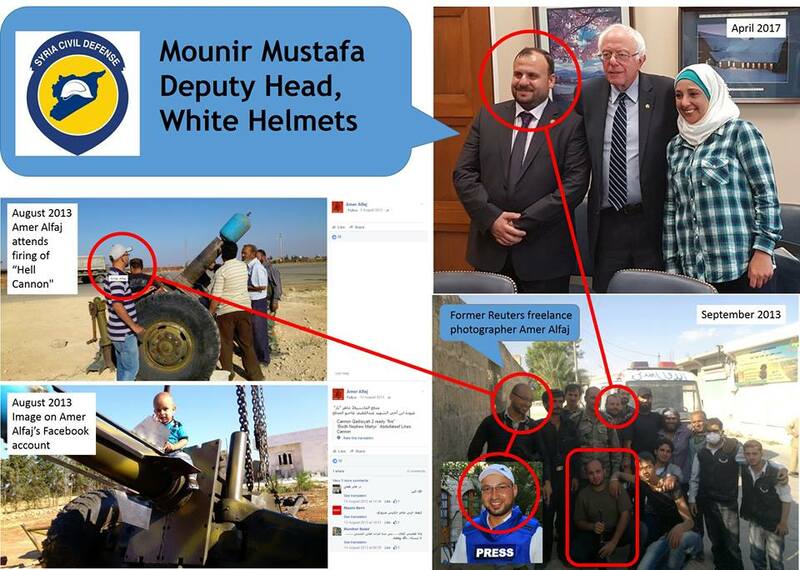 Left: Mounir Mustafa in courtyard of Atareb Hospital, Aleppo, 26 August 2013, in a scene from Saving Syria’s Children; right: Mustafa, as Deputy Director of the White Helmets, meets with Sen. Bernie Sanders in Washington, 25 April 2017. (See https://wp.me/p4gebB-2PS). Montage linking Mustafa to a group containing an armed individual plus former Reuters freelance photographer Amer Alfaj, previously photographed attending the launch of a “Hell cannon” mortar. (See https://wp.me/p4gebB-2PS and https://bit.ly/1Tkul7M). 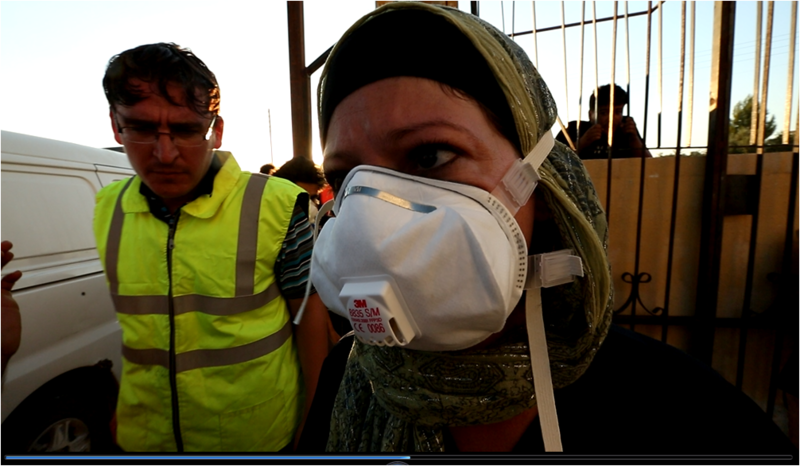 The figure in the yellow hi-visibility vest who appears alongside Dr Rola Hallam in Saving Syria’s Children (left) is senior White Helmet Ghassan Al Mustafa (right). (See https://wp.me/p4gebB-2PS). See also The Napalm d’Or? 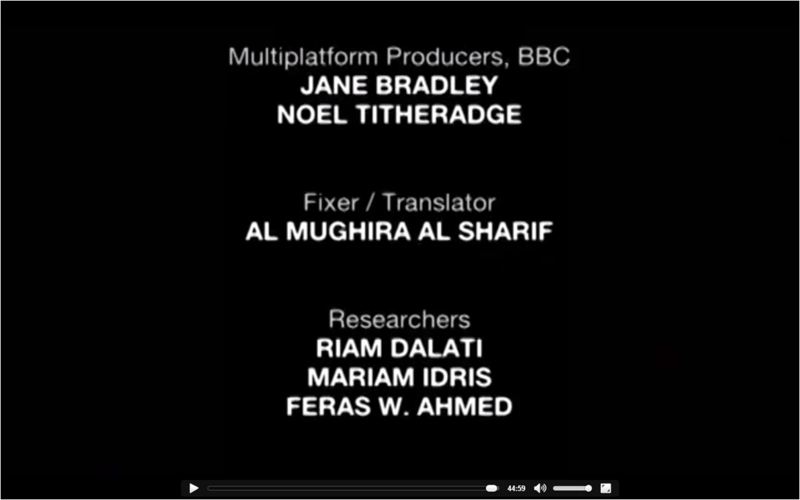 Mughira Al Sharif is credited as “Fixer/Translator” on ‘Saving Syria’s Children’. He can be glimpsed at various points in the programme, most distinctly at the wheel of the car which takes Ian Pannell through an ISIS checkpoint (at 10:33). A 2011 article tells how Sharif helped to found the Syrian Revolution Istanbul Committee and reports his aim as being “to help bring down the Syrian regime”. An image in which Sharif poses with “some friends” in the armed opposition was posted on Monday 26 August 2013, the day of the alleged napalm bomb attack. Notably, Sharif was clearly not so traumatised at witnessing dozens of allegedly injured and dying children and teenagers at Atarab hospital that he felt any qualms about posting another celebratory image of child fighters the next day. Both Susan Dirgham in her letter to the BBC of 2 July 2014 and another complainant have argued that Al Sharif’s involvement in ‘Saving Syria’s Children’ breaches BBC Editorial Guidelines. Fuller details here, updates here and here. At the start of July 2014 BBC Worldwide began blocking You Tube copies of ‘Saving Syria’s Children’, including the copy I had been linking to in my correspondence with the BBC and that referenced by Susan Dirgham in her complaint to the BBC. 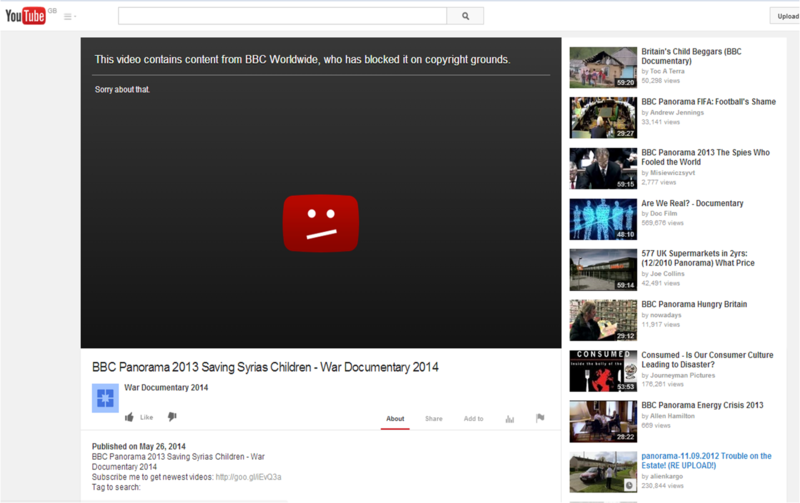 The final existing You Tube copy of ‘Saving Syria’s Children’ was blocked by BBC Worldwide between 25 and 28 July 2014. Dozens of other Panorama programmes remain freely available on the site. 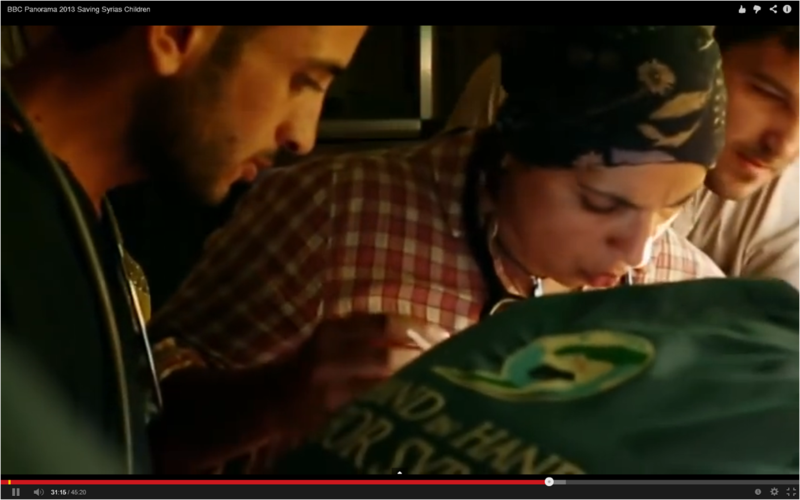 The UK BBC iPlayer version of ‘Saving Syria’s Children’ expired on 30 September 2014 (17 October with BSL). This copy adheres to the timings in this blog and can be downloaded here. A somewhat higher quality copy is here. On 1 August 2014 BBC Worldwide provided this response to questions about the You Tube blockings. At least four full-length You Tube copies of ‘Saving Syria Children’ have been blocked by BBC Worldwide since the start of July 2014. Fuller details here. Subsequent correspondence with the BBC here, here, here and here. This edition of BBC2’s Newsnight was devoted to the consequences of the UK Commons vote on intervention in Syria exactly one year previously. It included footage of the “napalm bomb” incident accompanied by the narration “by chance, just as MPs voted, these images of a chemical [sic] attack were shown for the first time”. 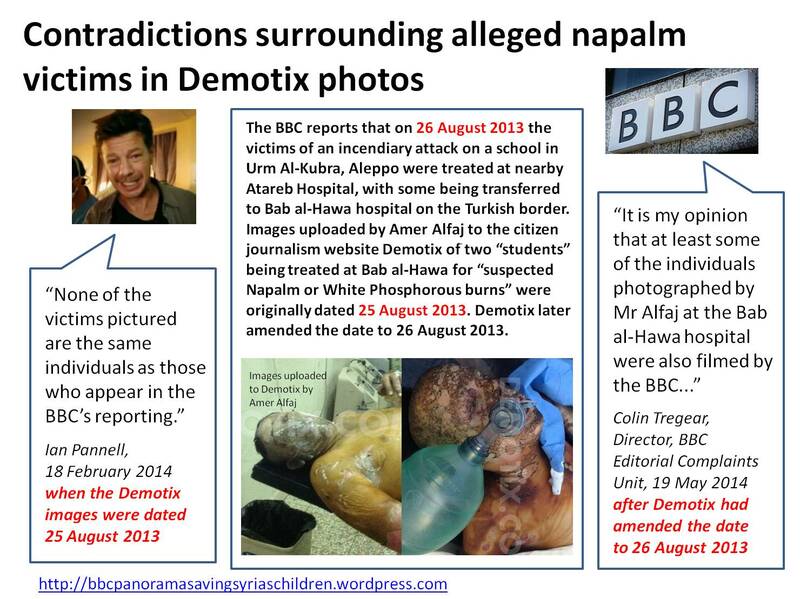 A subsequent broadcast on the BBC News Channel some hours later substituted the “napalm bomb” images with footage from an alleged chemical attack on Saraqeb, Northern Syria on 29 April 2013, originally broadcast in a BBC News report of 16 May 2013. The images were not identified and the substitution was not acknowledged. The narration continued to inform viewers that the substituted images had been “shown for the first time” on the evening of 29 August 2013. This matter is now the subject of a separate complaint to the BBC. (Links to correspondence above). Update July 2015: the BBC Editorial Complaints Unit has acknowledged that the substitution of footage represents a breach of BBC editorial standards for accuracy. (See BBC website here for published decision). Update September 2015: an appeal requesting consideration of outstanding concerns about BBC editorial policy and practice has been rejected by the BBC Trust. A further complaint (see here and here) regarding apparent breaches of the Geneva Convention and other concerns regarding the ethics and integrity of Dr Saleyha Ahsan has been lodged with the BBC. Update March 2016: The BBC Trust’s final decision on this complaint is here. 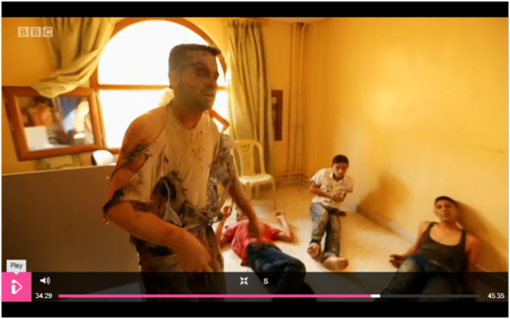 Panorama – Saving Syria’s Children – BBC One, 30 September 2013 (relevant section commences 30:38). 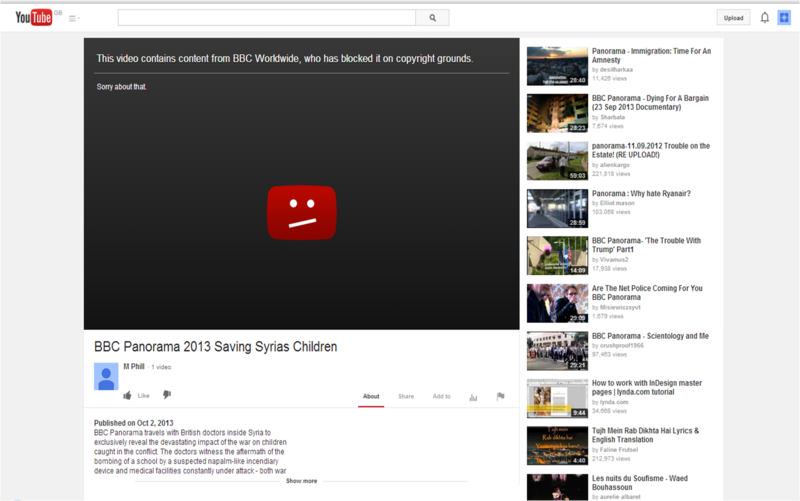 BBC Worldwide has blocked all You Tube copies of ‘Saving Syria’s Children’. Correspondence between the BBC and myself (and latterly another complainant) is logged here. In November 2015 I gave this interview to Sputnik Radio. In March 2014 I gave this presentation for Frome Stop War. The video was also posted by OffGuardian and on Craig Murray’s blog. In December 2015 I handed copies of this letter to Jeremy Corbyn MP and Emily Thornberry MP. I believe that the BBC’s rejection of my request represents an obstruction to the pursuit of a prosecution under the covenant, to which the United Kingdom is a signatory. I BELIEVE THAT THE EVIDENCE WHICH I AND OTHERS HAVE GATHERED CLEARLY DEMONSTRATES THAT THE BBC HAS COMMITTED THE GREATEST BETRAYAL OF AUDIENCE TRUST IMAGINABLE BY A NEWS BROADCASTER – THE FABRICATION OF AN ATROCITY FOR THE PURPOSES OF WAR PROPAGANDA. SUCH AN EGREGIOUS TRANSGRESSION IS QUITE POSSIBLY UNIQUE IN THE HISTORY OF BROADCASTING. I THEREFORE RESPECTFULLY ASK THE TRIBUNAL TO UPHOLD MY FREEDOM OF INFORMATION ACT REQUEST OF 14 JANUARY 2016 AND TO INSTRUCT THE BBC TO RELEASE ALL THE DOCUMENTATION REQUESTED FOR THE SCRUTINY OF MYSELF AND OTHER JOURNALISTS. AS WELL AS IT BEING VERY STRONGLY IN THE PUBLIC INTEREST FOR THIS MATERIAL TO BE ACCESSIBLE, AS OUTLINED ABOVE ITS RELEASE WOULD FACILITATE MYSELF AND OTHERS IN PURSUING RIGHTS OWED UNDER ARTICLE 20 OF THE INTERNATIONAL COVENANT ON CIVIL AND POLITICAL RIGHTS. Following a hearing on 24 November 2016 my appeal was dismissed by the Tribunal. On 2 July 2014 Susan Dirgham, National Coordinator of Australians for Mussalaha (Reconciliation) in Syria, lodged a complaint about ‘Saving Syria’s Children’ invoking sections of the BBC Editorial Guidelines which relate to Accuracy, Impartiality, Fairness, Conflicts of Interest and Accountability. Ms Dirgham’s complaint was rejected by the BBC as untimely. Some of the analysis, in some of the earlier reports in particular, has been superceded. I do not endorse every interpretation contained in these reports. 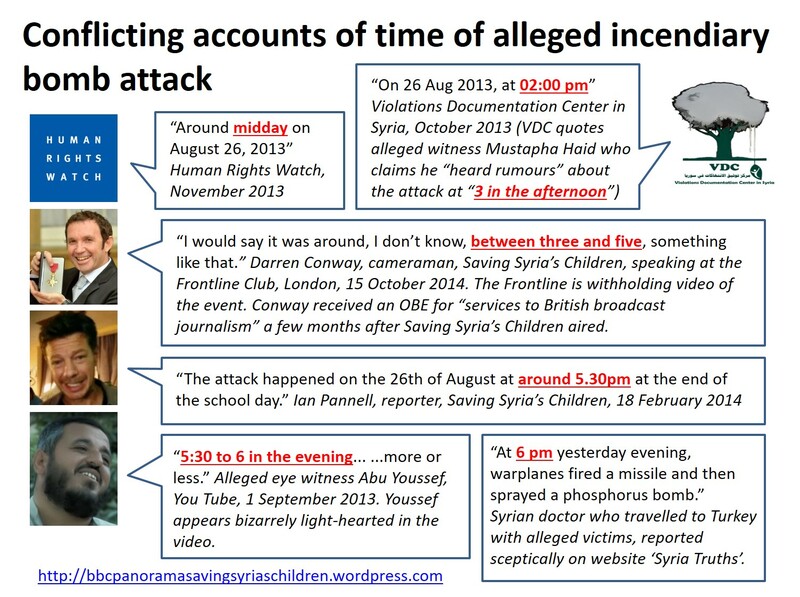 The Truthseeker – Media ‘staged’ Syria Chem Attack – RT, 23 March 2014 (relevant excerpt here) NB please consider downloading – copies of this material are frequently removed from YouTube. Mordsache Skripal und Giftgas-Lügen in Syrien: Die Rolle Großbritanniens seit 2011 (Teil 6) [Murder case Skripal and poison gas lies in Syria: Britain’s role in 2011 (part 6)] – Jürgen Cain Külbel, RT Deutsch, 26 December 2018. (English translation here). Hansard reports the two Commons votes on Syria on Thursday 29 August 2013: Division No. 69 (9:59pm) on the Labour amendment and Division No. 70 (10:17pm) on the government motion. As MPs vote, the BBC is playing a report into a horrific incendiary weapon strike on a school near Alleppo. Many children have been badly burnt. In its initial response the BBC stated that that boy in the white shirt “appears relatively unscathed”. The same boy appears at 01:17 in this non-BBC video from the day, calmly walking downstairs accompanied by the caption “These are not performing actors”. Note that the left hand curtain at the back of the room has been pulled back from its previous position (see below and images 6 – 10 here). Craig Murray has more recently commented here and here. In an article for Foreign Policy Dr Saleyha Ahsan, one of the British doctors featured in Saving Syria’s Children, gave the date of the alleged attack as 27 August, a highly surprising error for a journalist to make, especially considering her statement that “out of all the war zones I have ever been to, today has been by far the worst”. 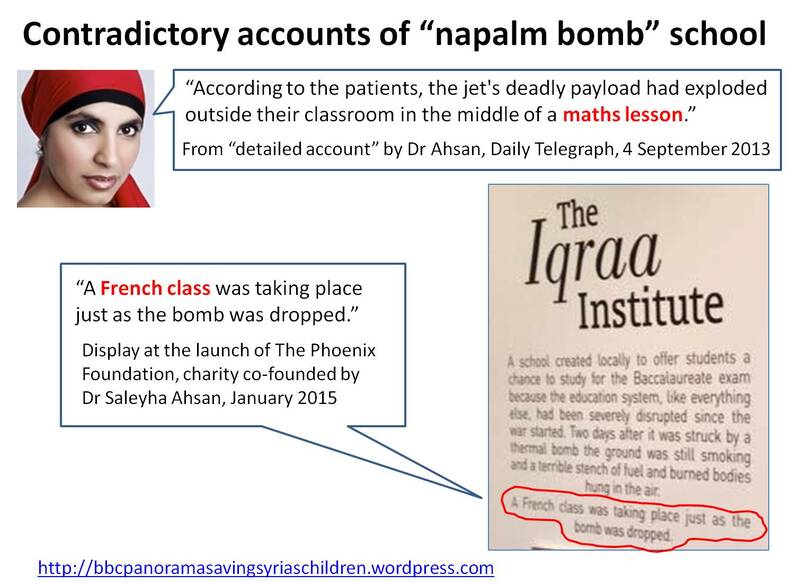 In a 3 October 2013 article Dr Ahsan wrote “This month, Dr. Hallam and I found ourselves in a school that had been hit by a napalm-like bomb”. This seems intended to suggest that Doctors Ahsan and Hallam were present at the school as it was allegedly being attacked, rather than at the hospital treating the alleged victims; “this month” is also odd as Dr Ahsan claims elsewhere to have visited the school two days after the attack, i.e. on Wednesday 28 August . 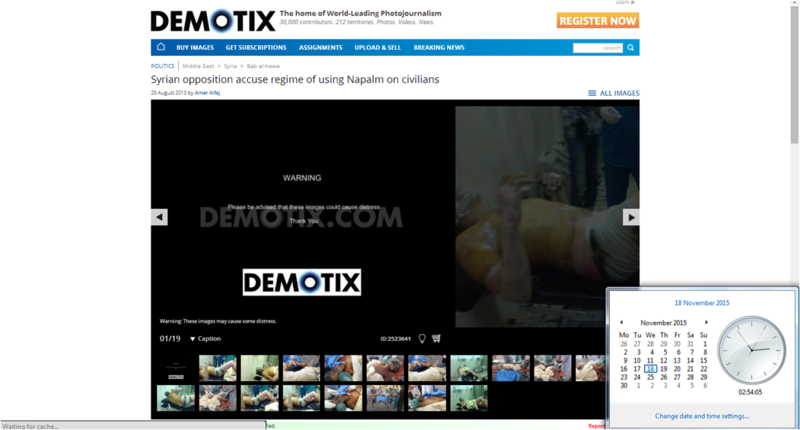 The Demotix images had been used to illustrate the “napalm bomb” incident in contemporary UK and international media reports. Dr Ahsan now gives Siham (or “Seham”) Kanbari’s age as 16, whereas previously both she and Ian Pannell had stated she was 18. A display at The Phoenix Foundation’s launch stated “A French class was taking place just as the bomb was dropped”. Ian Pannell states that Siham Kanbari “had been in a maths class when the blast ripped through the window”. SeeDr Saleyha Ahsan: contradictions in accounts of alleged incendiary bomb attack. The screengrab is from BBC Two’s Newsnight of 29 August 2014. Issues surrounding this programme are discussed here. On page 15 of this Human Rights Watch report Dr Ahsan claims that Anas Said Ali died “two weeks later”. 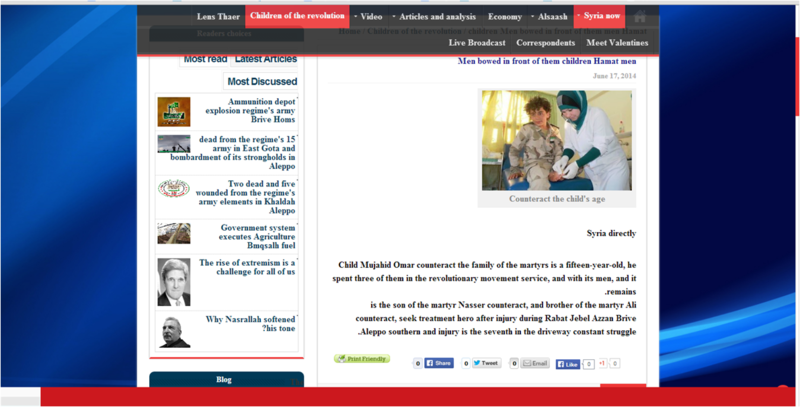 The female nurse who appears alongside Dr Saleyha Ahsan at 31:17 in ‘Saving Syria’s Children’ also features in an image on this site dated 17 June 2014, apparently treating a child combatant at Atareb Hospital. The site names the child as fifteen year old Mujahid Omar and claims he has spent three years in the “revolutionary movement service”. Hand in Hand for Syria’s logo is visible on the nurse’s white tunic, raising further questions for this UK registered charity (see section above Dr Rola Hallam and Hand in Hand for Syria). The reference is to 37:37 in Saving Syria’s Children where Dr Saleyha Ahsan attempts to insert a cannula into Mohammed Kenas‘ foot, stating “As you can see there’s nothing coming up for me to put a cannula in”. 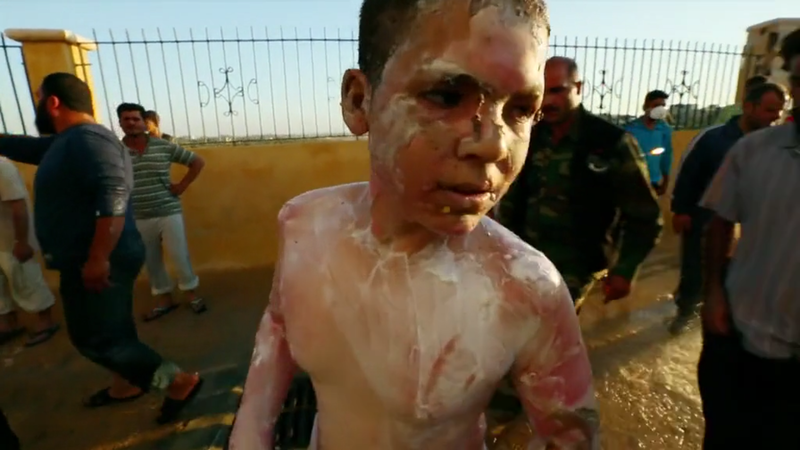 On 18 July 2014 BBC News published a short “retrospective” on the “napalm bomb”. From 32 – 40 seconds the background figures in the hospital, including Lutfi Arsi and the alleged teacher, are heavily blurred. The group does not approach the ambulance either from the direction of the school or from that of the apartment building – the locations which the BBC claim were attacked – but from an intermediate point on the opposite side of the road. There appears to be no activity taking place in the environs of the school. For more detail on this see “Napalm bomb” school located. (Top row) Man in combat fatigues, cap, dark body vest and carrying weapon boards ambulance at 8s in Video B; (Bottom row) Unidentified male in combat fatigues and wearing radio headset, discussed above and in this post. 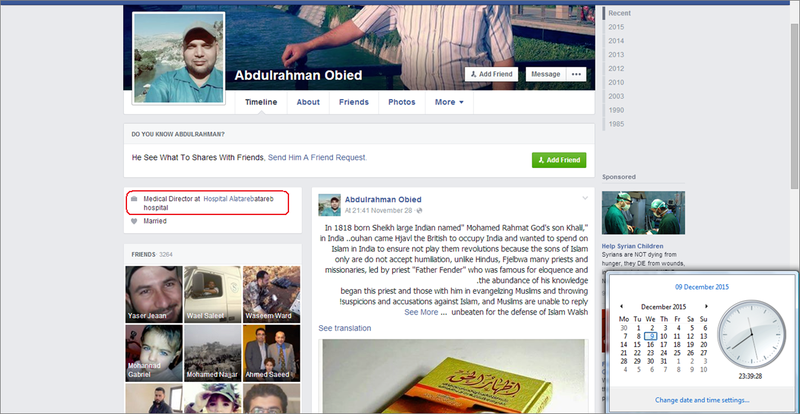 Until at least October 2013 the Deputy Commander of the Free Syrian Army was identified as a Colonel Malik al-Kurdi. 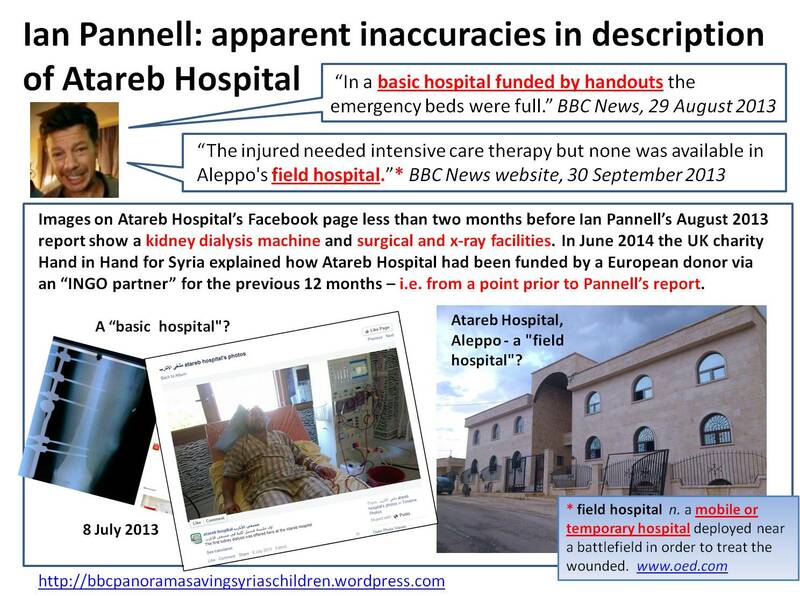 On 30 September 2013 Ian Pannell describes Atareb as a “field hospital”. 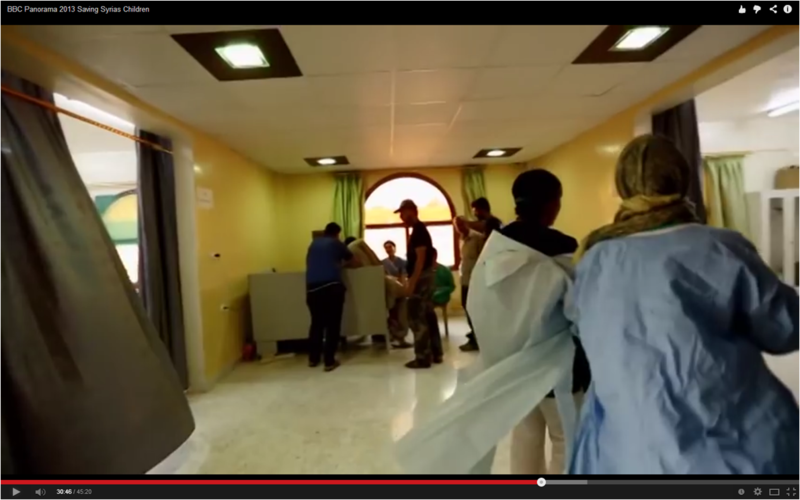 Dr Hallam also refers to Atareb as a “field hospital” at 38:04 in ‘Saving Syria’s Children’. The team’s second report detailing local insurgent factions is here. The BBC now states that Siham Kanbari died on 19 October 2013. This Human Rights Watch report, which uses the Violations Documentation Center information as the basis for a list of deaths from the “Urm al-Kubra Attack”, states (p20) that “A witness told Human Rights Watch that one of the dead was identified as Mohamad Feda Khenass, 15 years old”. 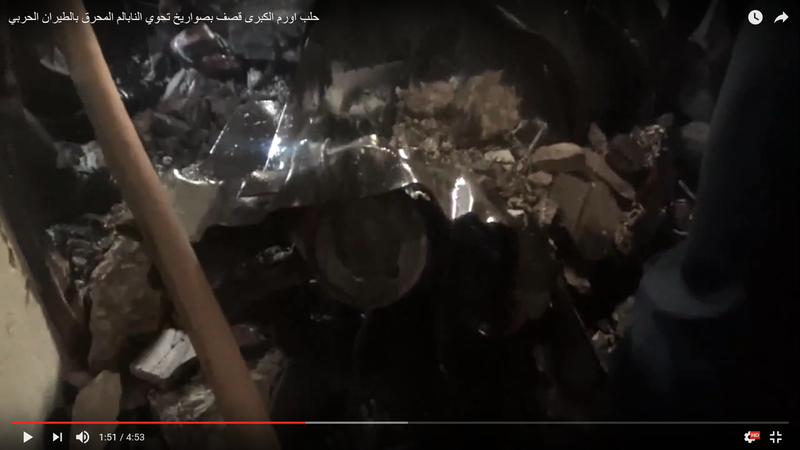 At some point prior to 8 April 2015 the You Tube channel (“Aleppo and Idleb”) which hosted this video was terminated. Please refer to this copy. The fighter who speaks in the film also appears at 3:25 in this video hosted by this You Tube channel. 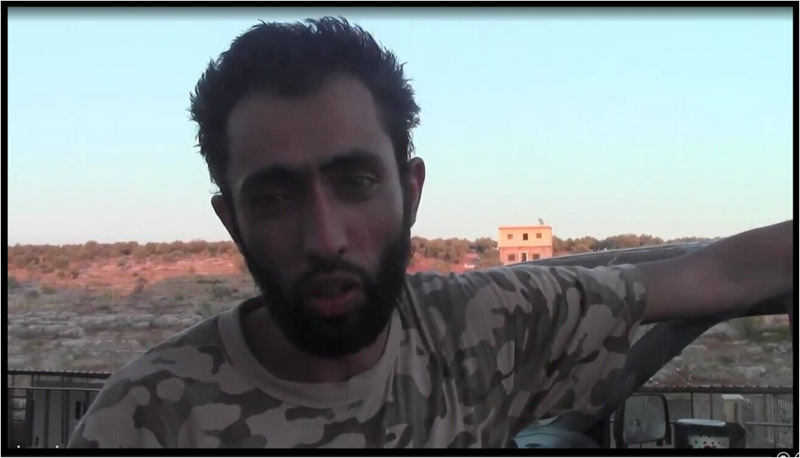 Update, September 2016: As noted in this post the fighter has been identified as Yusuf Zou’a, formerly a commander of the Ansar Brigade and military commander of Jaysh al-Mujahideen (Army of Mujahideen), which is allied to the al-Nusra Front. 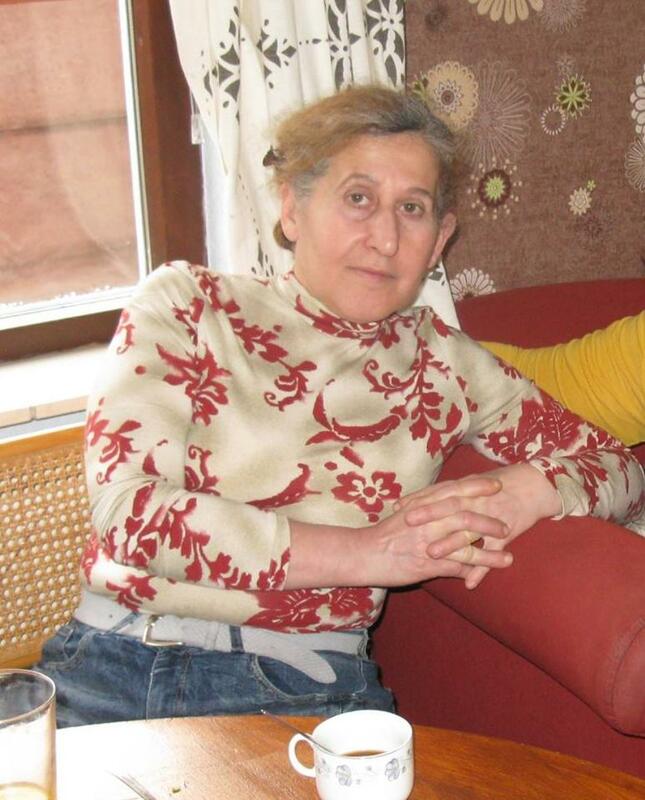 Zou’a was recently killed in Aleppo. See here, here and here. I understand that other videos in the collection contain similar references to a religious teaching centre specifically for females. It is questionable whether it would be likely or indeed permissible for a male teacher to be engaged at a girls’ religious school. 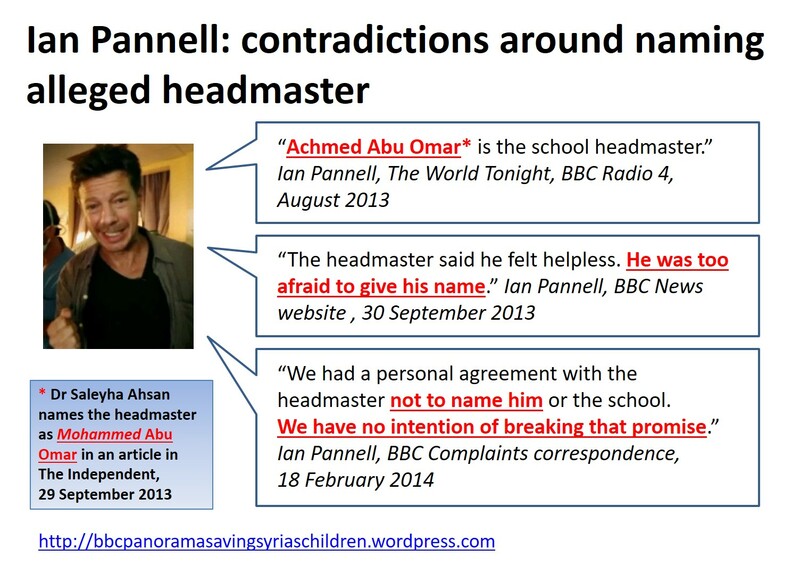 The BBC’s reports also feature a male headmaster, named by Dr Ahsan as Mohammed Abu Omar. Both men’s attire would seem to be incongruously casual for staff of a “religious college”. 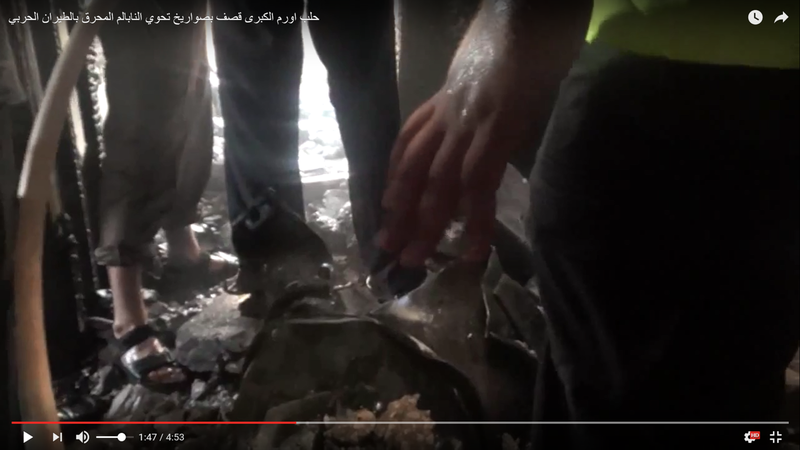 Other elements in the “Free Halab” videos warrant further scrutiny, for example the plausibility of the claim which I understand is made by the medic discussed above that he was able to listen to the conversation between the pilot of the MIG and his command centre via a walky-talky. According to a private translation of the reporter/presenter’s introduction to the Aleppo News Network video. 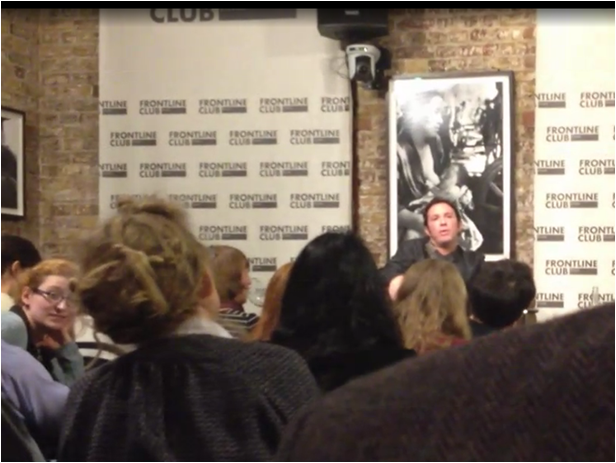 The Frontline Club states that it’s highly unusual decision not to publish video of an interview with ‘Saving Syria’s Children’” cameraman, director and producer, Darren Conway, in which Conway contradicted his colleague Ian Pannell over the time of the “napalm bomb”, was made in order “to protect those colleagues whose names were mentioned that work in extremely dangerous locations”. As noted here the only individual named in reference to Conway’s then most recent work, in Syria, was “Mughi”, or Mughira Al Sharif, who is both listed in the credits of ‘Saving Syria’s Children’ and who, as demonstrated above, openly proclaims pro-opposition sentiments on social media and elsewhere. On 17 March 2015, within hours of being posted and with only one view, another video (copy here) containing scenes from Saving Syria’s Children was blocked. I see you are now quoting a “practicing doctor” – yet they remain completely anonymous, without explanation. Would you care to explain this anonymity? How about a credited recording or video of them making these assertions ? Might that not be more convincing than an anonymous quote ? I see there’s no response to my query as yet. I’m surprised that, as you are demanding forensic clarity from the BBC, you would not recognise this anonymity as an issue; even if you were only to clearly state the qualifications and experience of said medic, even if for some reason you are not willing to name them. Its tempting to throw in the fact that even Harold Shipman was a practicing medic. Its a pretty broad term. You should also consider that they are talking about the effects of fire burns, I would presume the reaction to chemical burns could be different, and varied according to the chemical. have you considered just how many people would have had to be sworn to secrecy, and have agreed to partake in such a deceit, for it to work ? If you really think about it it would require a very high number. All the participants (“actors” as you prefer) ; doctors, nurses, production team, editors, producers etc etc etc. That is one hell of a lot of people to trust the whole reputation of the BBC on. Don’t you think ?? Just one of those would have to break ranks. The usual approach to any covert conspiracy, is: the less people that know, the better. In that case, this would be a pretty strange way to risk the whole integrity of the BBC. Think about it. I also see my original query is “awaiting moderation”, and I suspect may never appear. I do think, that if you want your investigation to be taken seriously, it is essential to be open to question and willing to answer points. Presumably you are after “the truth” ? I can see no abuse or profanity in my points that should make them unsuitable for posting. If you only want to publish comments in agreement, its no longer an open debate. It is well known that if people are determined to reach a certain conclusion, without always keeping open the chance that they are wrong, they can easily make the facts fit and ignore contrary evidence. In this particular case, the consequences of you being wrong can be very serious. Your real target is the BBC, and believe me that’s not an organisation that I am full of unqualified praise for, by any means. Not only are you dishonouring the terrible suffering of the victims (and by extension, 1000s of other civilian victims) and challenging hugely what integrity the BBC does have. You are also campaigning fiercely to discredit an aid charity, run by brave and compassionate people, which has provided essential humanitarian and medical help in Syria, and which at present is struggling to keep open the only “proper” hospital in an area under daily slaughter, serving 500,000 people. Whether or not they have empathy with the Syrian revolution or not is not the main point, their main empathy is with the suffering. They go to the areas they go, because that is where help is most needed, and because the Regime controls all official aid, and 90% ends up in government areas. Maybe you think that’s okay. 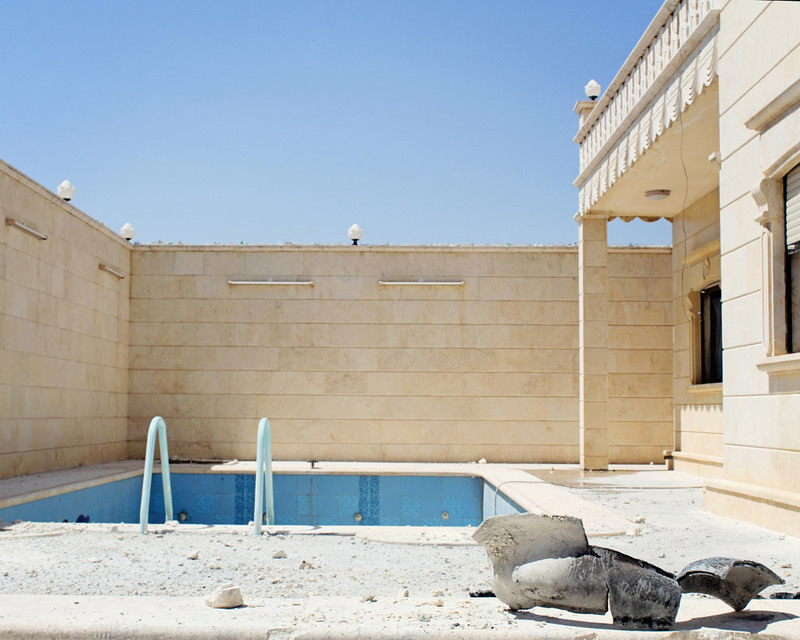 A doctor from that hospital returned home recently to find his entire family had been wiped out by a barrel bomb. Having already lost half his birth family in another attack. He was back at work the next day. I wonder what he would think of your campaign. Would it please you if that hospital closed ? It is not a game: make sure that, in your determination to “get” the BBC, you are not playing politics with people’s suffering. If one day, you are made to face incontravertible truth that you are wrong, you will have to face yourself in the mirror, and ask if your campaign might have put lives at risk, caused people to not donate to the charity etc. But most of all, you will have to apologise to the victims. Don’t let your tunnel vision blind you to the fact you can be wrong. You have managed to make a lot of people believe and spread your conclusions. But if your interest is politics, then you should realise by now that DOESNT automatically make you right. I now challenge you to publish and answer my points. Lets see if you are really interested in an argued truth, rather than just fuelled by hatred of the BBC. And finally – the very morning that Panorama was advertising its update programme, Assad forces “vacuum bombed” a school in Raqqa, on the first day of term. Even on its Mid East website page, the BBC made ABSOLUTELY NO MENTION OF THIS. As with many other atrocities. Isn’t this strange behaviour, if as you think, it is a proxy of anti-Assad forces ? The source who provided the doctor’s quote, and name, requested the anonymity. Quite possibly the doctor herself would be happy to be identified. Last try with this video. Don’t know why it wont post. It exists. Plus plenty more examples of Assad brutality. If you dont think his regime is perfectly capable of dropping burning chemicals on a school, you dont know anything about Syria. Get in the habit of downloading significant YouTube vids, for this reason. Don’t turn around and publish them though. Just keep them, making them private and sharing, carefully. Do practice attribution. Peace. You’re ignorance is beyond common sense. Assad is no terrorist. Assad is the only good buy in the whole region. He is struggling to fight against Sunni terrorism pouring into the country from all corners. Of course innocent people will get caught in the cross fire in a civil war, or be suspected in terror activities. Go and live in those countries and you know how there are constant doubts and suspicions. Only a complete moron tries to paint Assad as the problem. He originates from a tiny minority community, Alawites, which Sunni Muslims brand kafirs. The Sunni’s want the removal of all kafirs in the area to establish their caliph. This is where the entire conflict is built on. Tell me what civilian did not die when Britain was fighting Hitler? If the world would have interfered into the Nazi conflict and branded Britain the enemy, Hitler may have won. People need to stop the anti-Assad propaganda which is a Sunni argument. The problem with the media is that they want a story more than they want the truth. They never inform the viewer what Islamic affiliation the person they interview has. It would put a lot in perspective if they added the Muslim affiliation of the person interviewed. Assad’s military is loyal. It’s religiously pluralistic. At it’s core, it is mostly Sunni. Many Sunni Syrians support Assad. 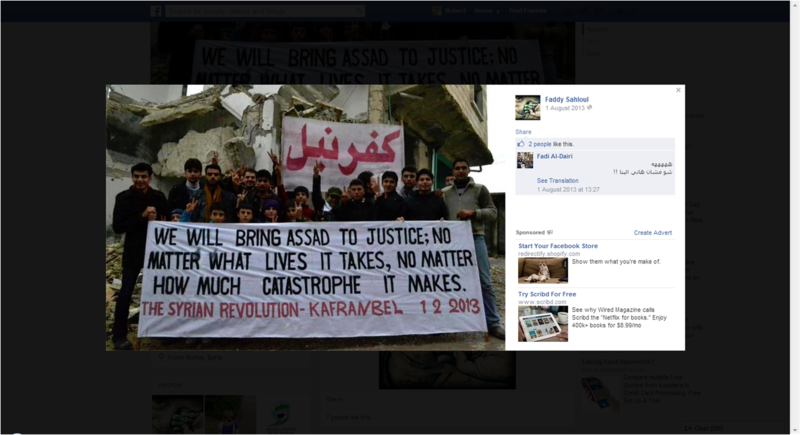 Syria is secular. “Sunni” is too broad. I’d say, the militants are Wahhabi -Salafist or Takfiri Salafist(al Qaeda/Daesh). Also, Uyghurs, mercenaries, etc.. 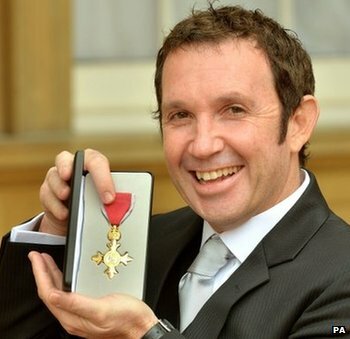 When you consider that 5 years ago the filthy Brit Intel had already warned the French that they were starting action to topple Dr Assad, according to French ex Foreign Minister Roland Dumas, what would you expect from the filthy Brit mouthpiece..
Yeah in 2005, everyone you spoke to knew Syria was the next on Britain’s list, because of what happened in Iraq. I think the first protests were about the economy, not freedom. The Syrian Brothers were armed in readiness, but not all their number wanted a full scale conflict but the west is really good in projecting an image, in this case that it would be easy to depose the regime. This is about engineering World War 3 so that way we can have a global government/ army as a “solution” so that it “never happens again”. Create the Problem secretly, manipulate the Reaction thru propaganda organs like the BBC so you can get the desired Solution- more power and money. The BBC, totally controlled by the globalists (on record) and one of its mouth pieces, is simply doing its part. It is doing what it is told. Lying, lying, lying. Surely you dont expect the TRUTH from BBC about Syria ??? HELL they could not even tell the truth about the Scottish referendum. My computer says this page cannot be saved when I hit the save button (before choosing what format to save in. Is there any way you can republish this whole thing in a way that it can be saved by us? The IEA showed the footage from the Panorama programme to a consultant plastic surgeon in his rooms at a leading London teaching hospital. She asked the doctor if he could talk her through what the images showed, what in his opinion might have caused the injuries and what his prognosis would be from what he saw regarding the severity of the injuries and the likely outcome. He said the blister on the boy’s right cheek was a first degree burn which would heal without the need for any skin graft. His hands were entirely different. He said it was a classic presentation of a severe burn where the skin detaches itself from dermis beneath and slides off as it dies. He said it would need extensive grafts. The IEA put it to the doctor that there had been an allegation that they weren’t real hands but were prostheses. The doctor said it was the perspective which made them appear larger, and that he saw nothing to suggest that the burns weren’t genuine. The doctor considered that the victim would be unlikely to survive, he said the telltale sign was the skin pattern on the boy’s back: the white patches were not new skin but areas of full thickness burn, where the skin had literally been cooked through by the intense heat. He had trained with a doctor who had treated napalm victims in Vietnam. He said the presentation was consistent with the victim having been burnt by a napalm type substance which produced deep burns which kept on burning, the fuel for which was difficult to remove. 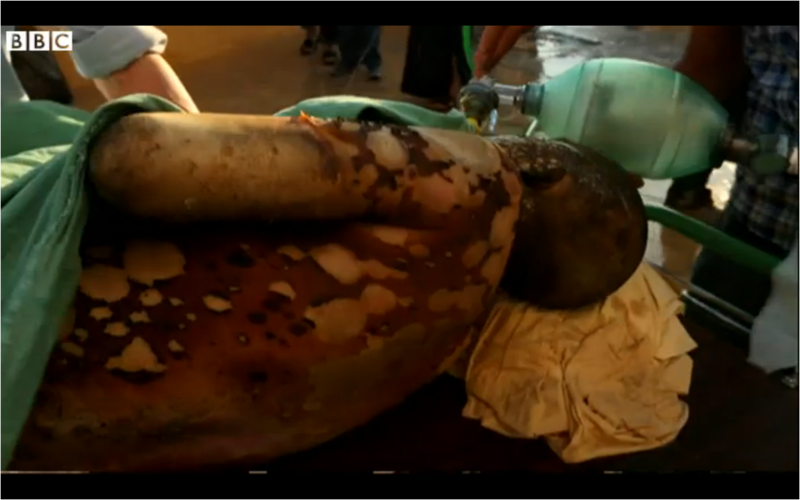 It explained the random areas of burns on the victims, only affecting where the substance had stuck. The doctor was asked to comment on why the victims appeared to be in relatively little pain given the supposed severity of their injuries. He said that the worse (i.e. the deeper) the burn the less it tended to hurt, because the nerves had all died. The most painful burns were often the most superficial. With serious burns such as these a doctor could predict a patient would not survive although the patient might be walking and talking at the time. The doctor had himself seen a woman walk into a burns unit, chat to him about what had caused the burns on her legs, and subsequently die as a direct result of the burns she had received. The doctor advised that skin is what keeps the fluid in our bodies and once the skin has been burnt off the fluid leaks out and victims can die within 24 hours, but can nevertheless still function in the early stages. The doctor concluded that he was wholly convinced that the footage was genuine. The doctor took the view, from a review of the footage, that most of the severely burnt patients he saw in the Panorama footage would have died due to their injuries even if they had been taken to a leading European burns unit. He considered that the doctors shown in the Panorama had done everything correctly within the context of what was available and he saw nothing that suggested to him that anything was staged or exaggerated. Firstly, I should clarify that what I posted there were not my words, but a quotation from one of the responses that the BBC provided to Robert Stuart. However, you are correct, a name is not provided and that is not helpful. But I imagine that they would provide one to Robert Stuart if he asked (maybe he already has), and agree it would be unhelpful if they didn’t. I think I will take the above over the testimony of an anonymous doctor with 4 months on A&E, Mr Stuart. The more the BBC lies the better it is for Russia Today who blows the lies out of the water leaving the viewer with the view that nothing coming from the BBC is anything other than propaganda. ISIS was created to fight in Syria by the west and both Israel and Saudi Arabia will bomb anyone that attacks ISIS in the area and this is why ISIS fighters all carry made in US guns and the americans keep dropping supplies to the terrorists by accident, of course. Ajzizeera is the worlds worse for faking news but this allows the BBC to copy the content and then blame someone else if they get caught. Hey Robert have you ever seen the raw BBC footage that they claim the two different Rola quotes come from? I assume it can be verified to exist? Hi – I haven’t seen/heard the whole thing in it’s entirety but I am satisfied that both sets of words and pictures were, as the BBC claims, from the same take. They provIded a series of stills of the full sequence which shows the two slightly different viewpoints which appear in the two reports. I have written more about it here http://bit.ly/1QyKJPE – as I say there, while there is an abundance of evidence of fabrication, I don’t believe the editing of Dr Hallam’s famous interview serves as such evidence and it has never been my main focus. It has been helpful, however, in drawing attention to the matter. Holy f***, Widewater. Do you think your tactics of deceiving people through addressing their emotions will work? Not with us. You can recruit ignorant Sunnis and politically uninterested people, but not us. There is a video on youtube from VICE, title is “Ground Zero: Syria (Part 3) – The Atrocities Within Aleppo’s Field Hospital”. At 4:49 into the video is a child who looks like Ahmed Darwish. Thanks. Pretty certain it’s not “Ahmed Darwish”. This was eye opening… I usually do the antiwar.com gambit for info out that region but that site has its agenda as well. This article however pretty much undercuts all the headline grabbing stories that were touted by Obama & Kerry as a reason to bomb Assad. Sibel Edmonds has some eye-opening info on Antiwar.com. Her and one of her colleagues dissected Antiwar.com and found it to be thoroughly establishment. There’s no ‘alternative’ in that alt media org. Brilliant research and well done. I detest the BBC for their vomit worthy coverage of Aleppo, Aleppo, Aleppo, completely ignoring every other conflict zone – any footage of Yemen or Mosul for example? Funny how all their pet children/clowns/gimmicks have fantastic internet connections to broadcast this crap too. Really enjoyed the clip that surfaced recently of some Syrians telling the BBC reporter to f*** off and leave them alone because they were misrepresenting the situation and 99% support Assad. I watched the video (Patrick Hennigsen, Mike Robinson on Off Guardian. Whew! I was winded watching, let alone producing. Good job people! This site could be better (made more user friendly) organized. (author’s name on top of page along with other stuff, like links etc./ unlabelled archived material is useless. You need a search feature, again, top of page.) I hope that is taken as the constructive criticism it’s meant to be. Ignore me if I’m annoying. It doesn’t change my mind about the fantastic work you’ve done. Thanks for the feedback. I agree this blog is indeed creaking under the strain but I don’t really have the skills to overhaul it. I daresay it will happen at some point. Thanks for the excellent piece of work deconstructing the bs behind this story. i) For something just south of Aleppo, and apparently prominently located on high ground, it seems remarkably untouched. I’m surprised the ‘Evil Dictator’ (TM) Assad didn’t ‘Barrel Bomb’ (TM) it in order to destroy ‘The Last Hospital in Aleppo’ (TM). iii) To the left of the gateway, there is a ripped down Red Crescent sign, presumably relating to its original use (offices rather than a hospital given those steps?). iv) There is a lot of black scribbled Arabic graffitti on the walls to the left. I don’t understand Arabic so I have no idea what is written, but stylistically it looks like the typical terrorist territorial markings. v) Finally, I just love the cute black ‘no guns’ sign on the left hand gate post! When the Aleppo city gig fell apart, it looks like Rola Hallam et al have focussed on an Independent Doctors Association hospital at Ghandour in north Aleppo province, conveniently close to the border with Turkey. The IDA itself seems to be based in Gaziantep. The website gives nothing away about its funding. Doctors working at the site seem to live in Turkey and commute back and forth daily. Nothing unusual there then. Gaziantep, purely by coincidence of course, was the base for presumed MI6/SAS mission controllers (described by SAA military intelligence, based on signals interception, as speaking Arabic with an execrable English accent) during the terrorist occupation of Aleppo city. That is “Doc.” He is not a doctor. Ask yourself, why is he lying and what is false? Saw the Frome video on Friends of Syria site and left a comment, still looking at your analysis, very interesting. Dr Ahsan does have fingers in lots of pies, looked her up and saw her she’s interested in the Wikispooks secret trials stuff and visited Belmarsh gaol to read letters to the prisoners. She is a died in the wool Islamist by the looks of things, so no wonder she’s propagating against the Syrian government. I went to Belmarsh shortly after the opening of the camp at Guantanamo Bay and the other protesters were mainly young Muslims, caged prisoner supporters. That wasn’t long after the Muslim Association of Britain MAB was formed mainly by radicals. In 2006 Hamas was elected in Palestine and the demos for Palestine increased in size dramatically, culminating in 2014, when we, in effect, lost Gaza to the Israelis. The good doctor appears to be quiet about that though, as Britain is not a fan of Hamas. She’s also quiet about Egypt, where Britain deposed Mr al-Morsi in favour of Mr al-Sisi. Of course the other factor is she was in Bosnia, where the war was exacerbated when the Yugoslavian Muslims were infiltrated by Islamists, an ideal scenario and an excuse to break up a strong economic bloc in preparation for the ”wall” coming down. The same happened in Afghanistan in the1970s. My interest in the Syrian conflict is partly the fact that I lived there for a short time and fell in love with the country and partly because I support Arab nationalism. I believe that the basis of the conflict was the dichotomy between the beliefs of the Syrian Brotherhood, and the Arab secularist regime. One thing I wouldn’t set to much store by what Wikipedia says, its altered all the time, and its not a reliable source. PS the good doctor appears to have some relationship with Ms Evonne Ridley, who converted whilst captured by the Taliban. Ms Ridley was part of the first convoy to Palestine in 2009, as it went through North Africa. She and some of her fellows were shocked when certain countries refused them entry into their capitals. Lots of their number came to my home town for a dinner shortly after they got back. One country that refused was Tunisia, which of course was one of the ”Arab Spring” countries that overthrew its Arab nationalist leader and instead, in 2014, elected a ‘big tent’ govt.. This so-called secular outfit is classed as non authoritarian by Britain, and allowed it to rewrite its constitution in order to make provision for the Sharia. America did the same in Iraq. Since its ”revolution” Tunisia’s tourist trade was badly affected by the Sousse shootings in 2015. I was there at the time but in Tunis capital and people were very ashamed. Many Tunisian people I have met since the ”revolution” are outraged by its effects. I Went off on one there but one thing struck me a few years ago when blogging, it was that Mr Galloway was keen for the Islamists who were part of the convoy, to display their political leanings. Foolishly Colonel Gaddafi let the convoy through Tripoli. His actions were repeated by President al-Assad later that year, as he let it through twice, when Egypt refused to let it travel through the Sinai, heavily Brotherhood; the people flew from Syria to the border crossing at al-Arish in the end.I know a few people who went and one has written a book, while another is a died in the wool Turkish fundamentalist, pro the Syrian Brothers and anti the Syrian govt. Both convoys reached Palestine and some people were allowed in Gaza with the supplies. I cannot help but think, if it was intentional or not, the whole event was promoting Muslim fundamentalism. Egypt and Tunisia, whatever you think of the toppled leaders were anti Islamist. Countries have a right to be, we don’t like it here and its a bit of a fad at the moment. People on the convoys were hobnobbing with the Brothers in Egypt and Hamas had an office in South Jordan according to Cliff’s book. People more and more believe they have knowledge of the middle east, but things are too complicated. After 5 years of research I’m writing a history of the different groups involved in Syria and their relation to Syria, a proverbial can of worms. Also British people appear to like ”just” causes so won’t choose a side, the dichotomy between Islamism and Muslim nationalism is very different to that of the Tories and the Labour party.